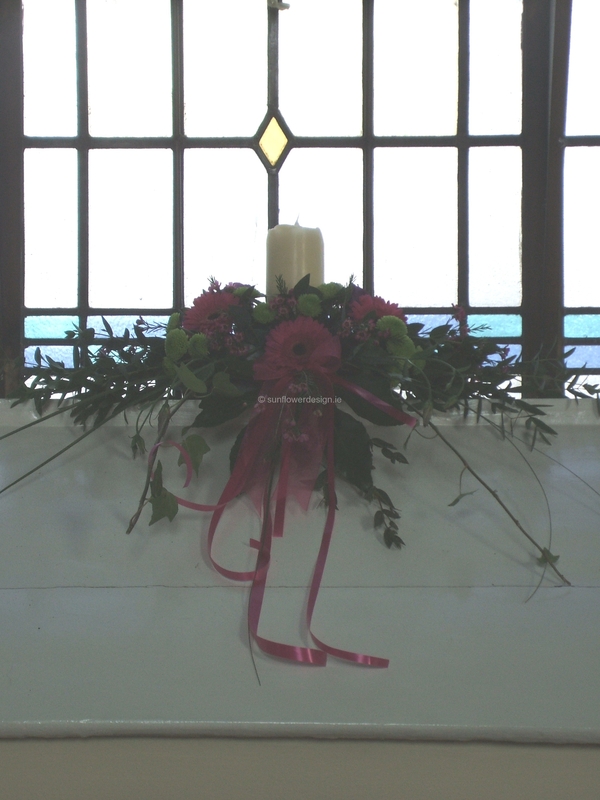 This section contains a selection of full weddings to show you how the flowers can co-ordinate with the theme of the wedding and the colour scheme to bring the whole look together. 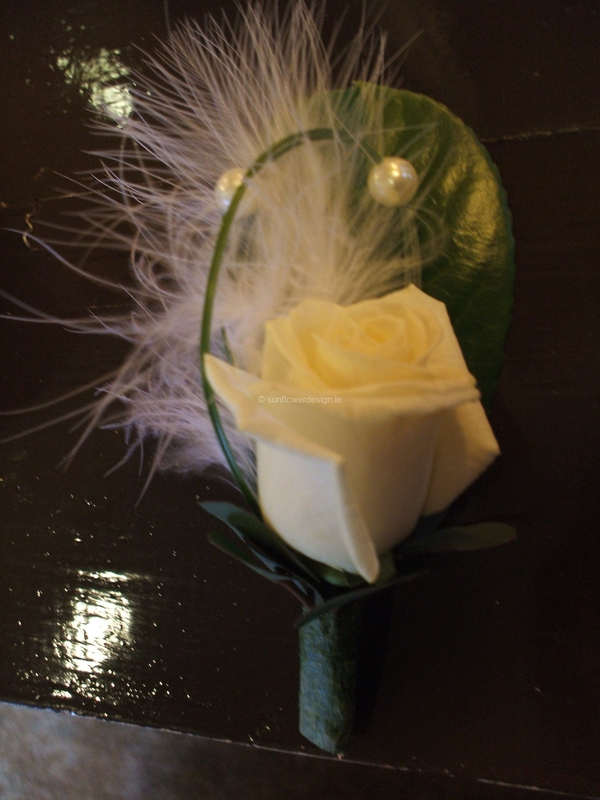 I have also included some notes about the designs and some feedback from some of the couples involved. 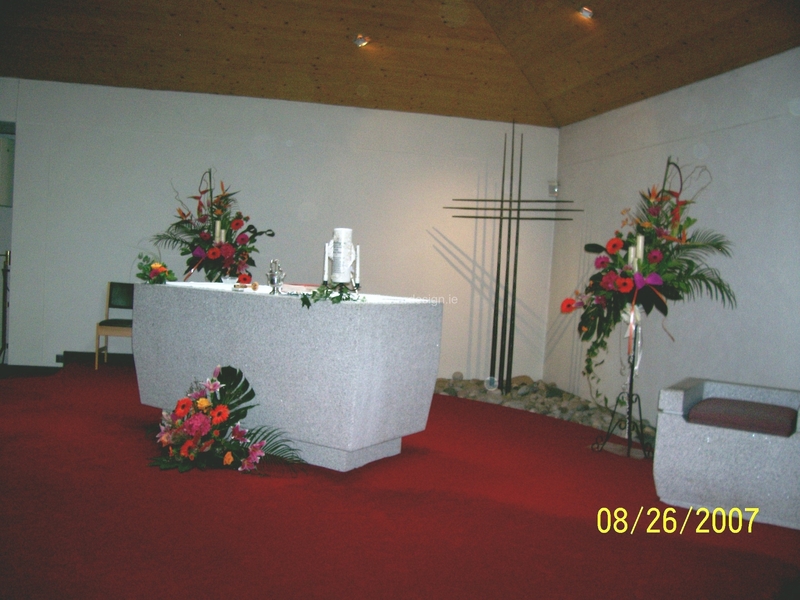 To view more pictures of our work see the Gallery page and the Services page. 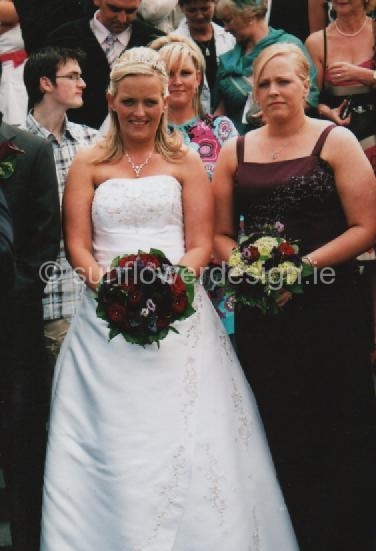 “I will never forget the first time I met Sarah – it was about 3 weeks before her wedding and she had been badly let down by another florist whom she had booked months in advance. 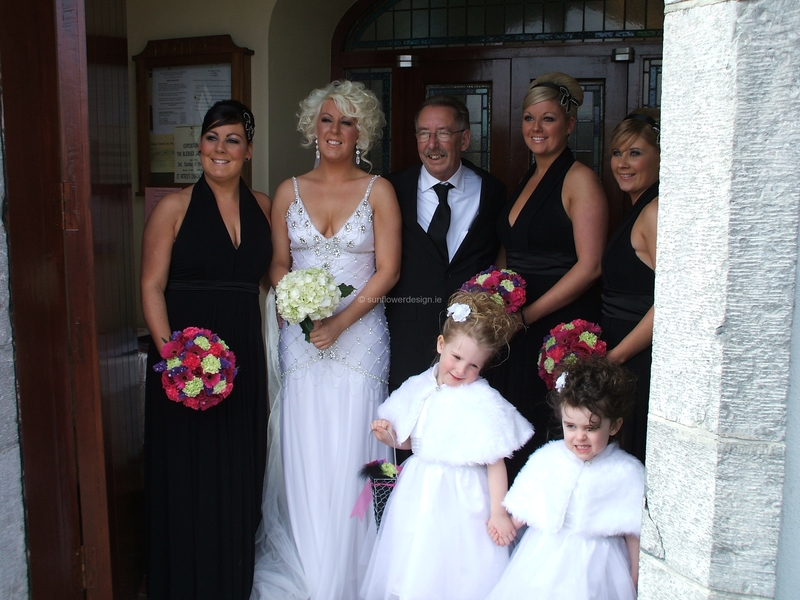 My Girls on Weddings Online (Thankyou thankyou!!) 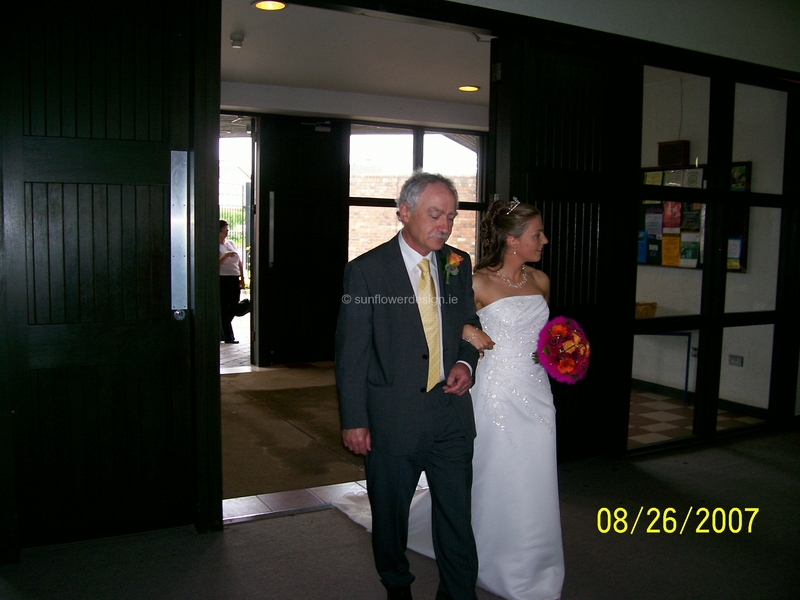 had recommended that she call me and she arrived after dark one evening more than a little anxious as to weather I would be able to help her so close to the wedding. 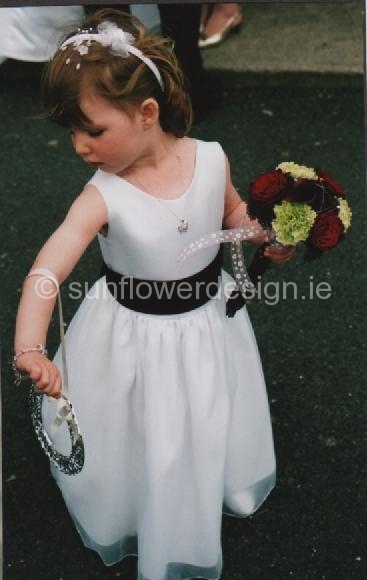 We discussed the style she was going for and the colour scheme of golds and ivories that she wanted to achieve. 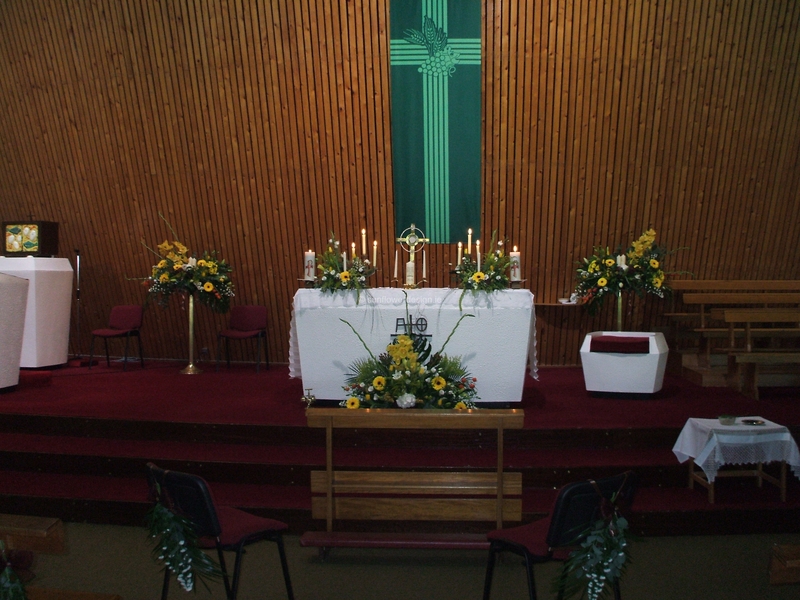 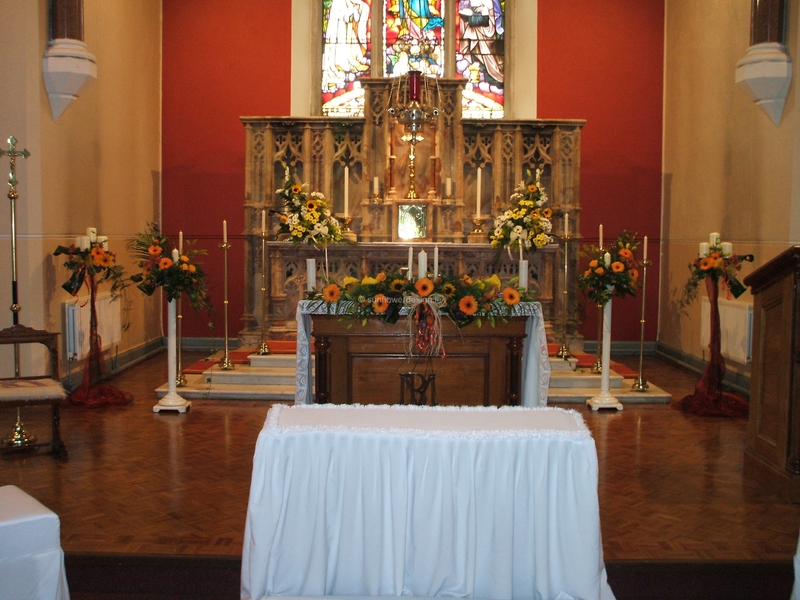 The Church in Beaumont is a little overpowering with quite a dark wooden interior so we decided to go for golds and yellows to try to brighten it up and to use candles in most of the arrangements. 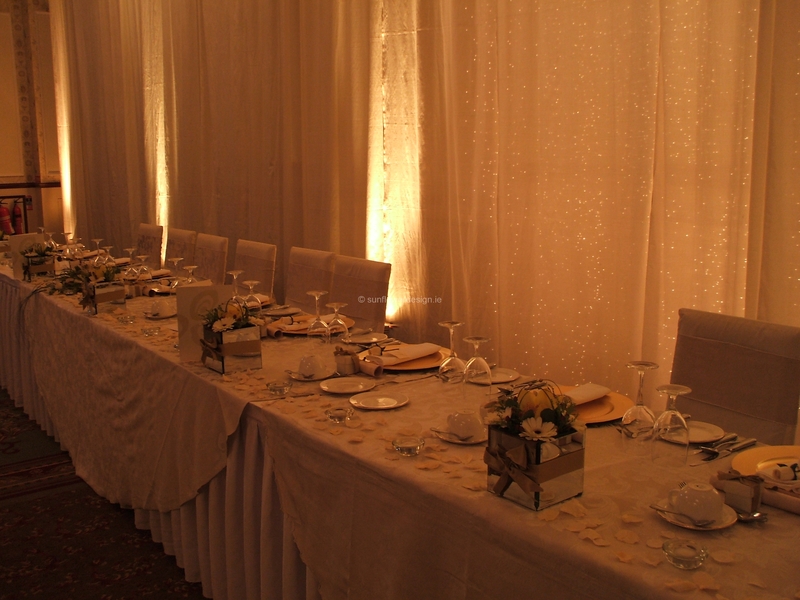 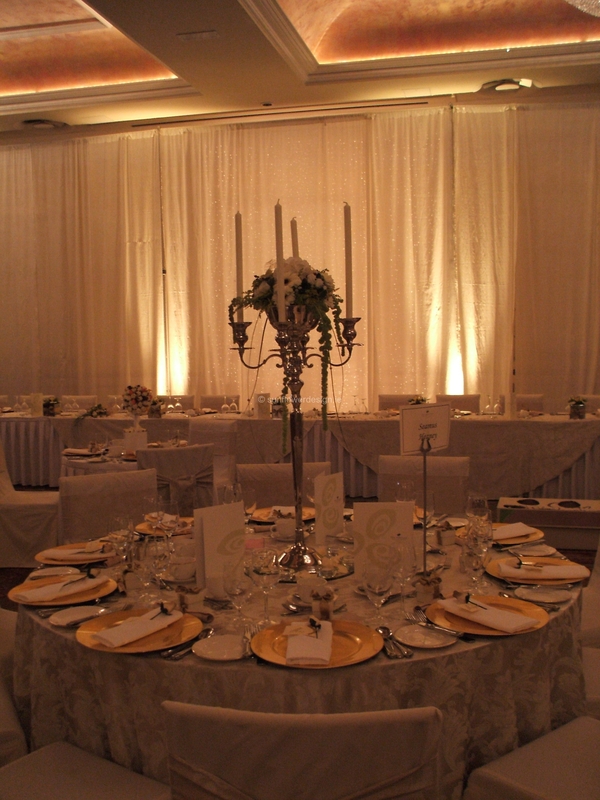 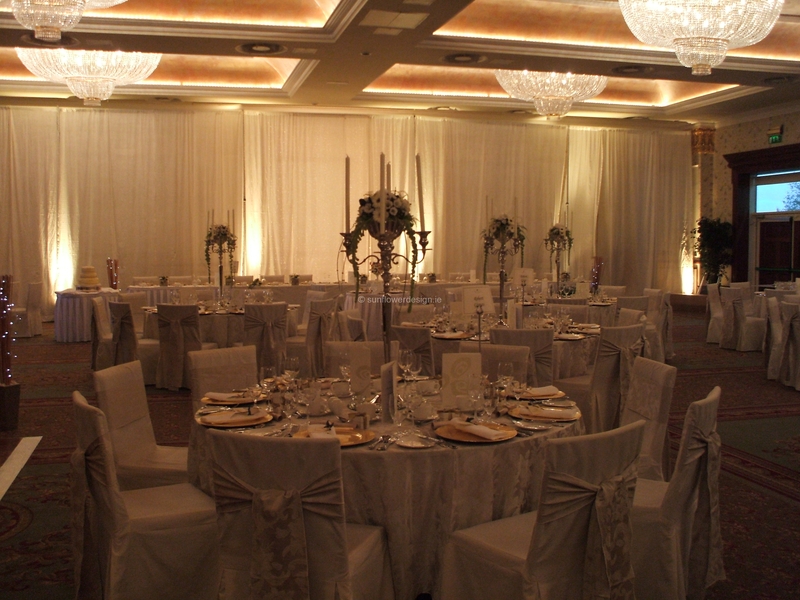 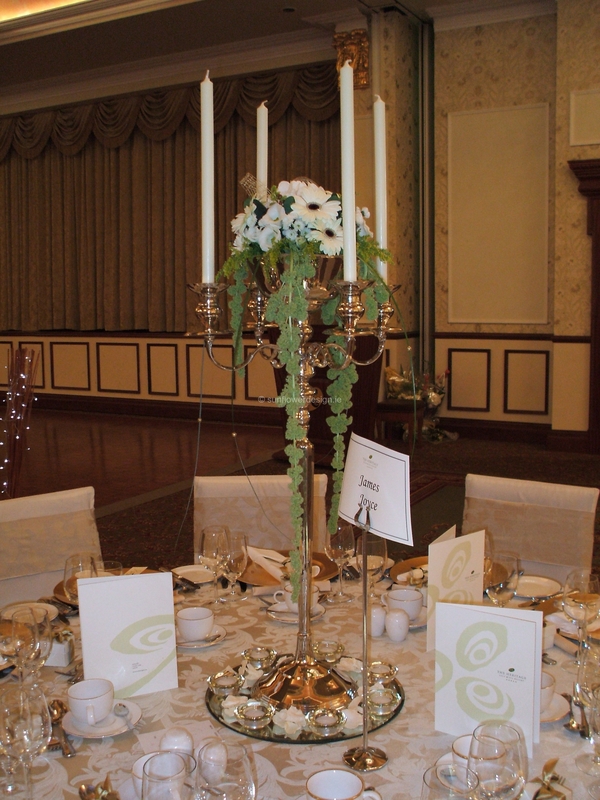 For the Hotel, Sarah had a fabulous vision using a starlight backdrop and tall silver candelabra to create a really beautiful and romantic atmosphere. 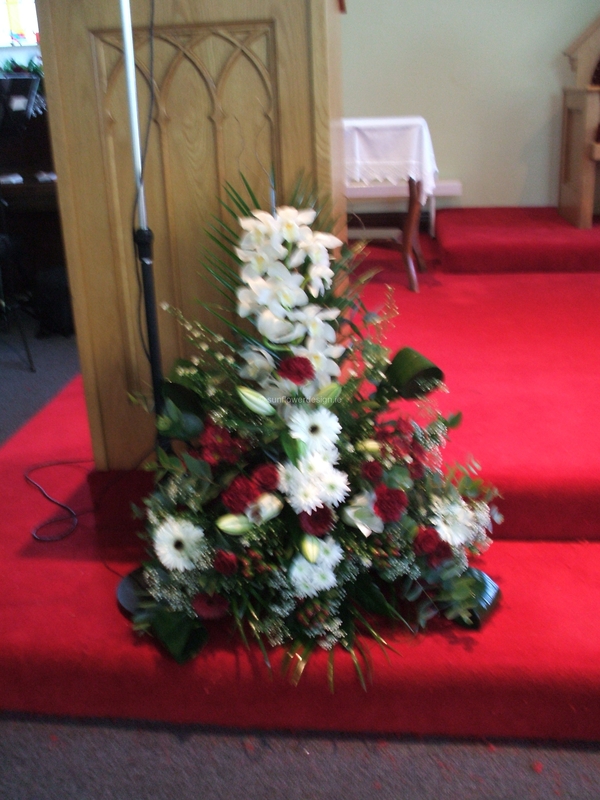 Although three weeks was cutting it fine (!) 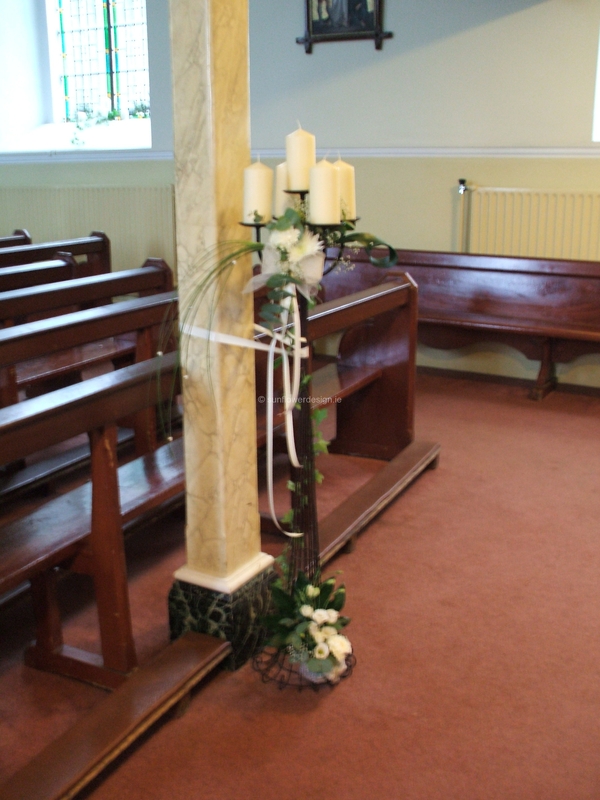 especially for such a large wedding, we managed to pull it off with lots of phone-calls, and not much sleep, and bits of candlesticks being couriered to me so I would get the size right!! 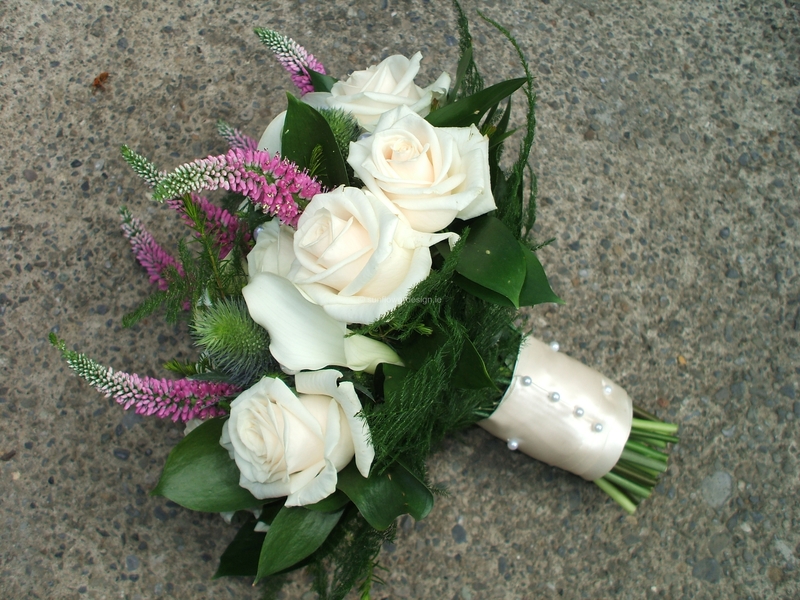 I think in the end the results were well worth the effort and I was really delighted to be able to help Sarah and hopefully restore her faith in Florists!” – Eileen. 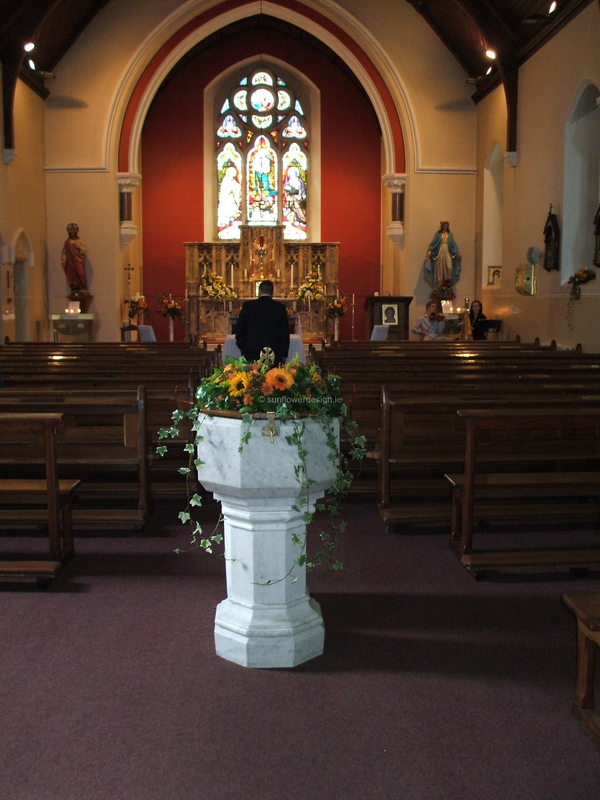 St. Charles Boremeo, Confey, Leixlip. 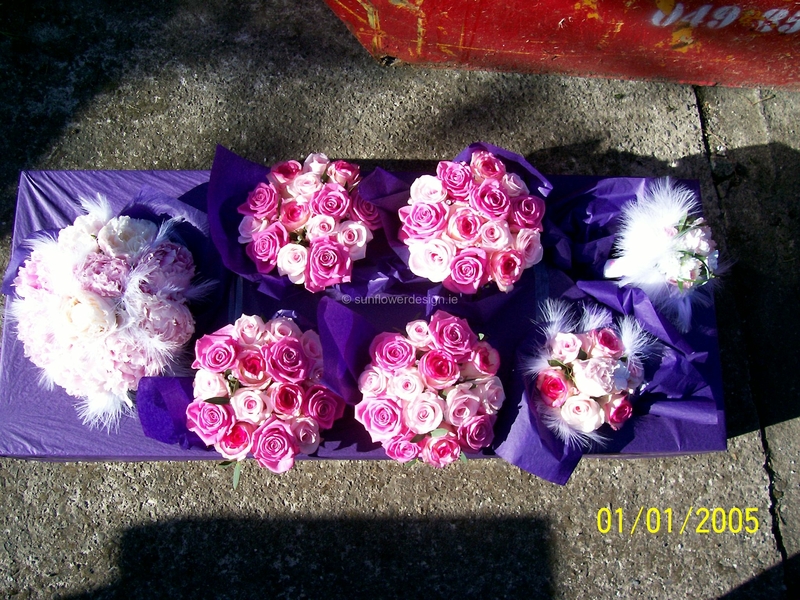 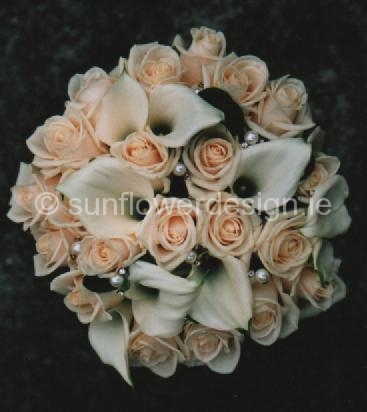 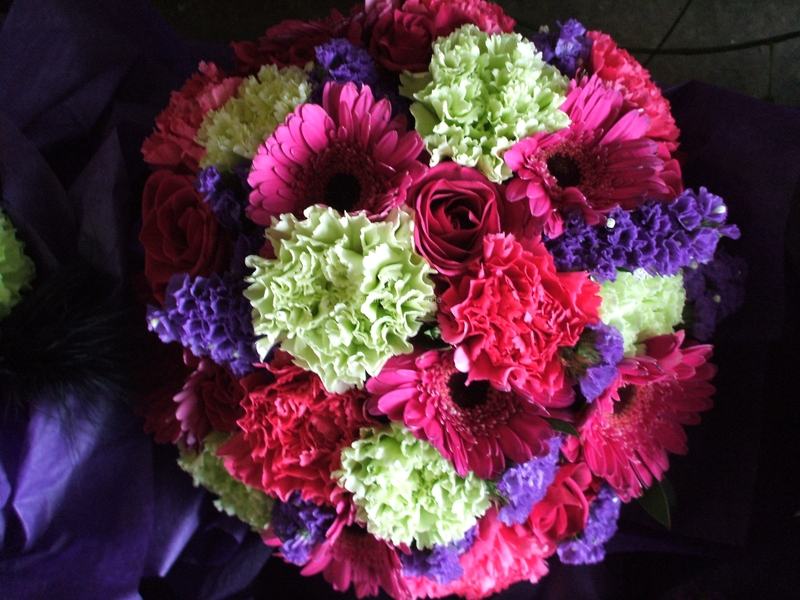 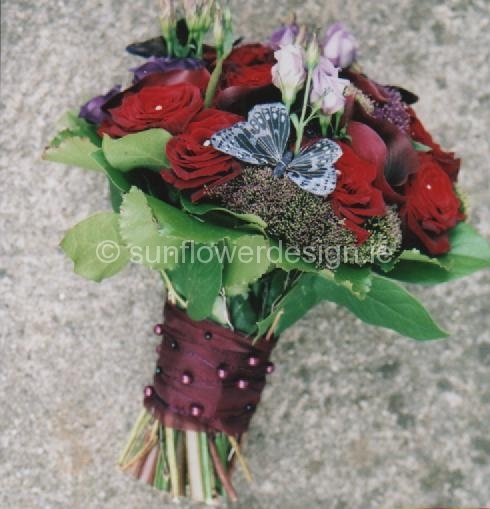 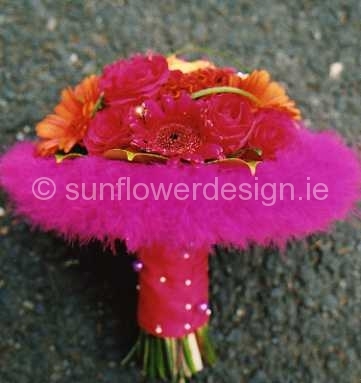 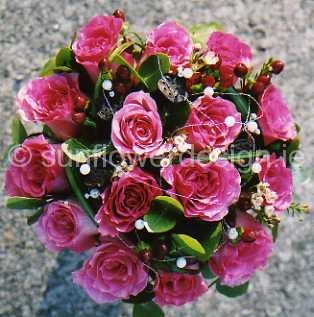 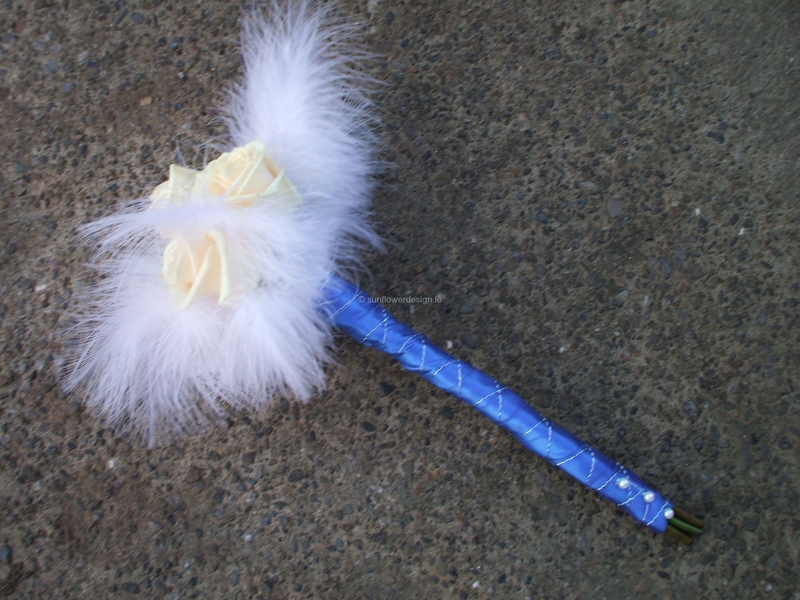 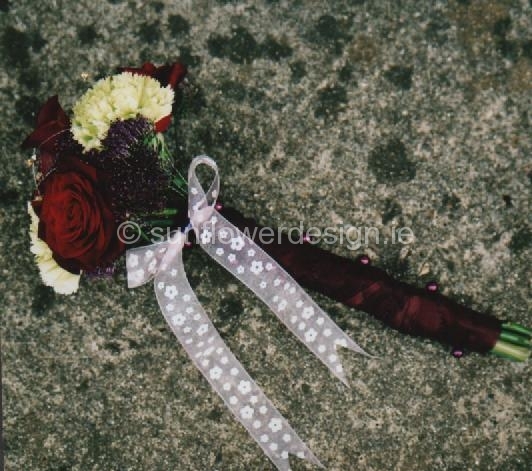 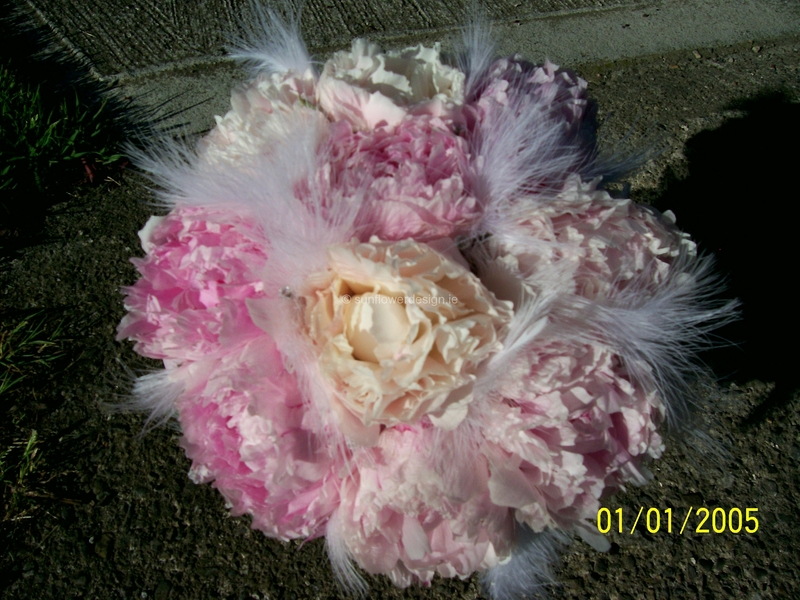 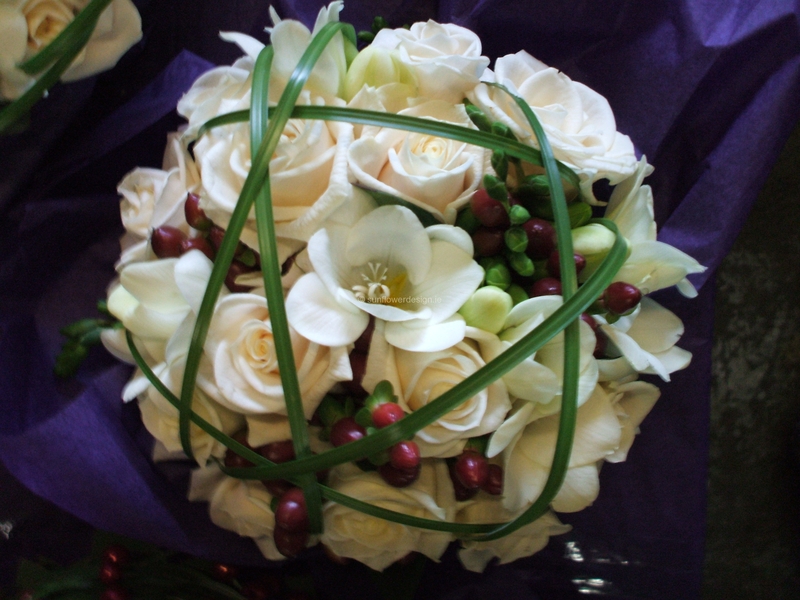 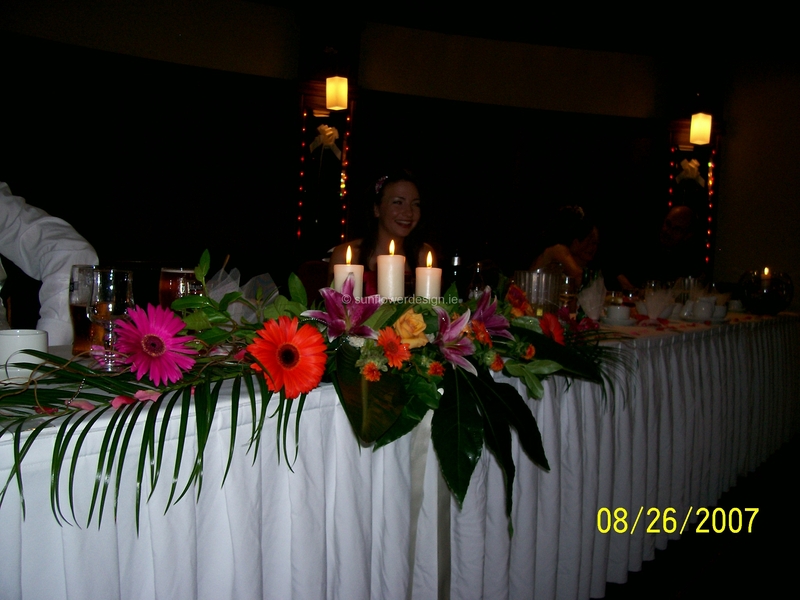 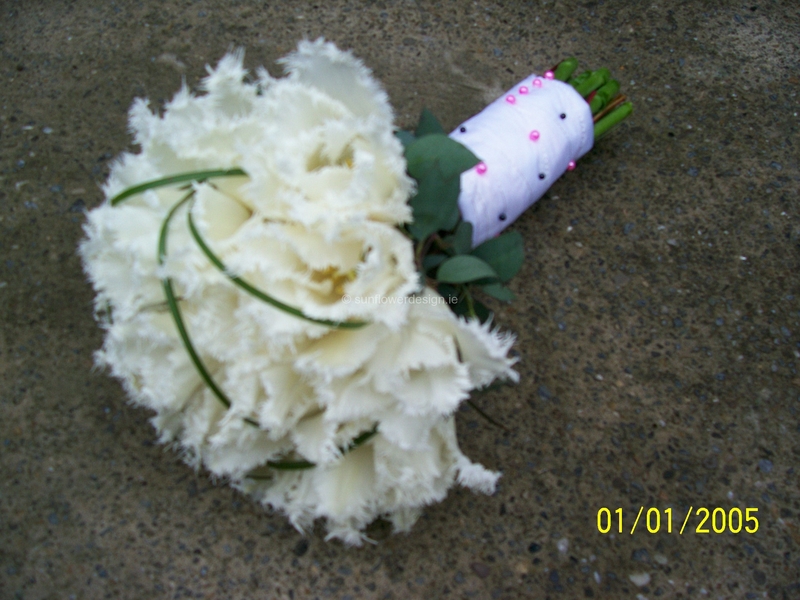 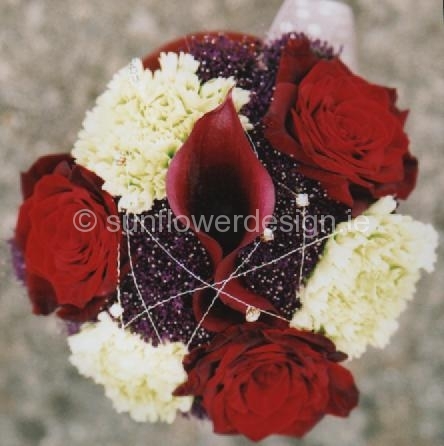 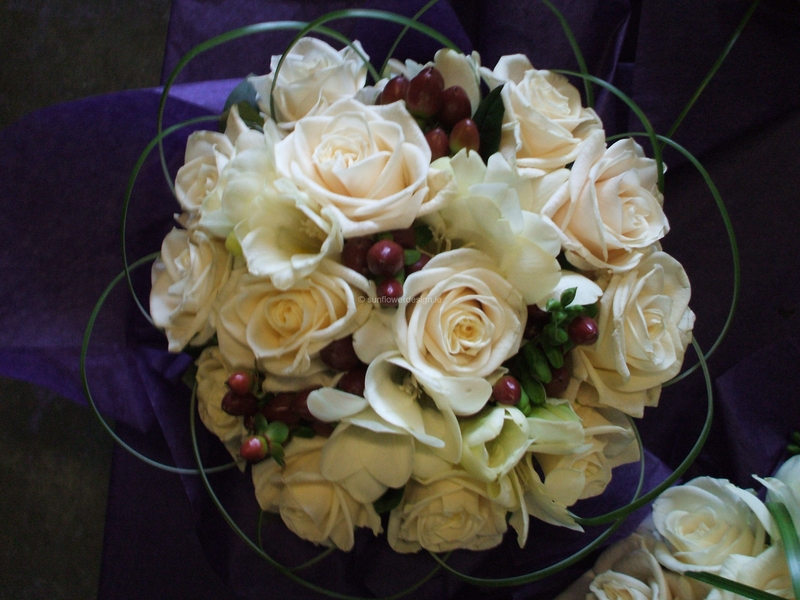 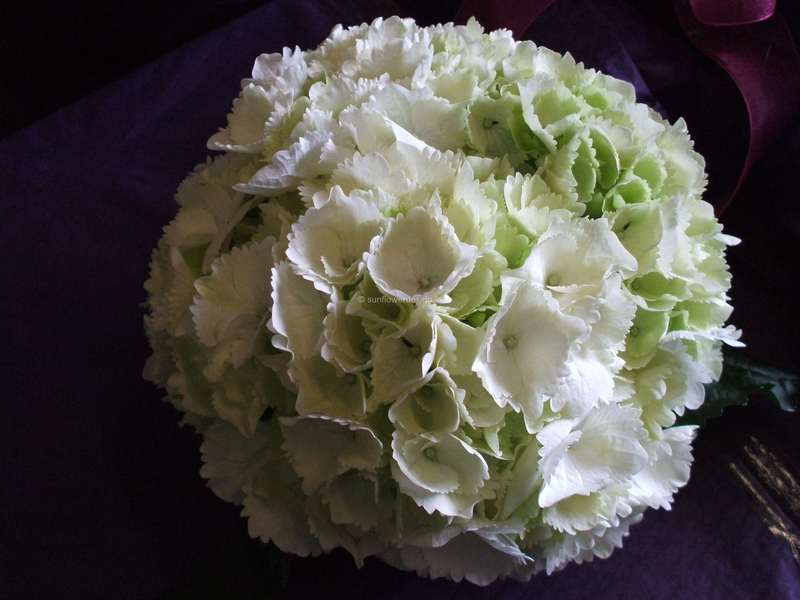 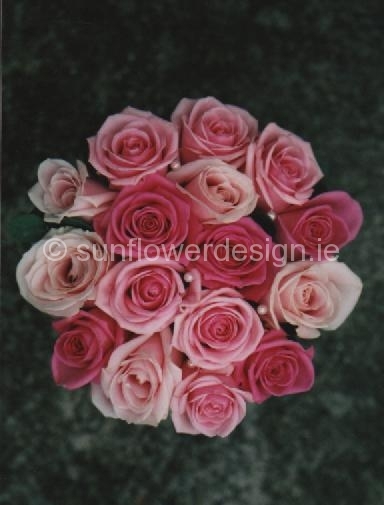 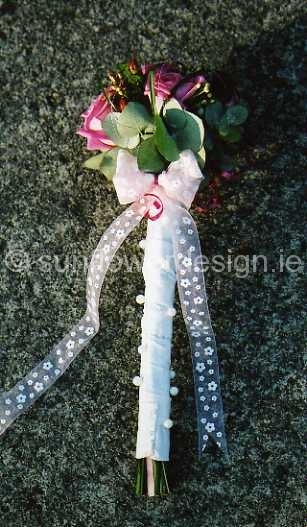 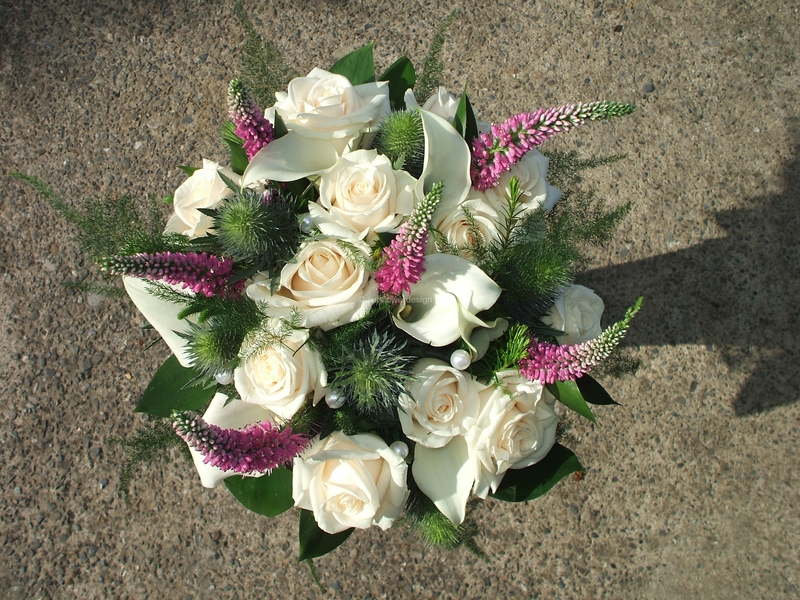 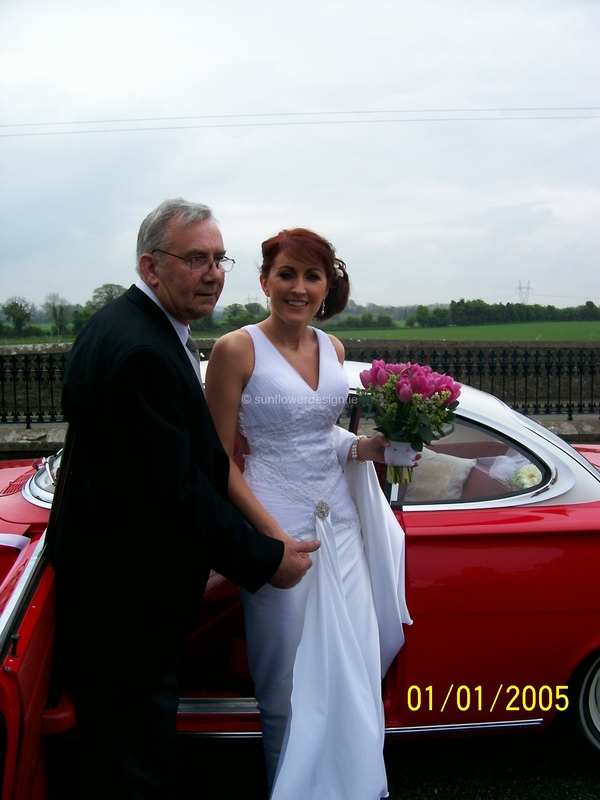 “Its always an honour to be a part of a friends wedding so when Niamh asked me to do her flowers I was delighted. 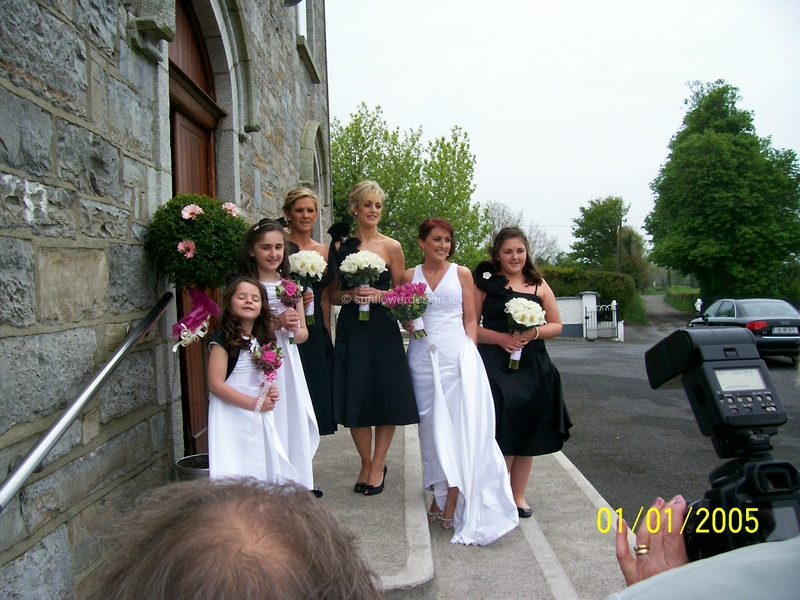 Niamhs style is modern, funky and bright! 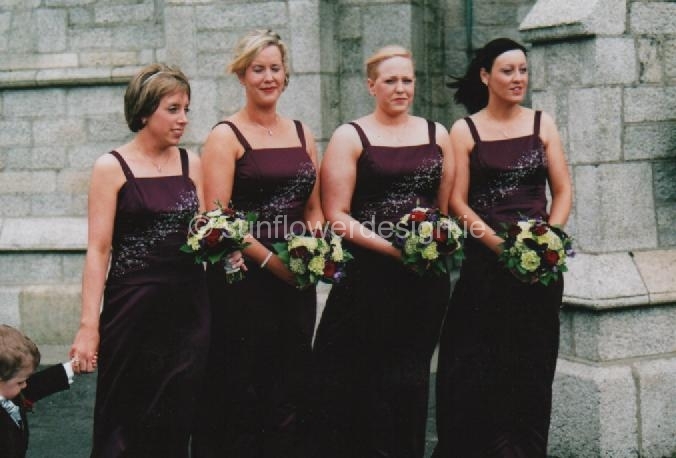 Her Bridesmaids Dress was the inspiration for the design of the flowers. 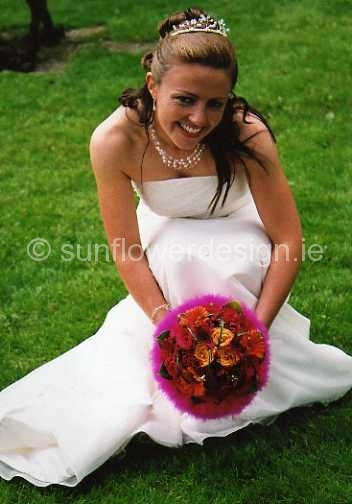 (Designed by Karen Kealy) Along with a love of all things Pink, Niamh also loves exotic flowers, large jungle style leaves and wanted everything to look “a bit different”. 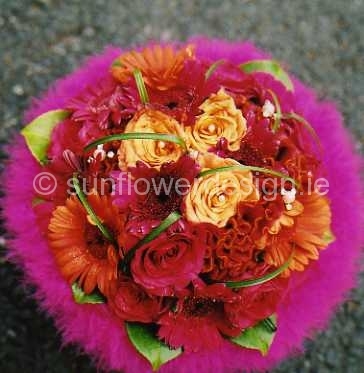 Niamh decided to go with cerise pinks and bright oranges with a feathery frame for contrast against the dresses and carried this theme throughout the Bridal Party, Church and Reception. 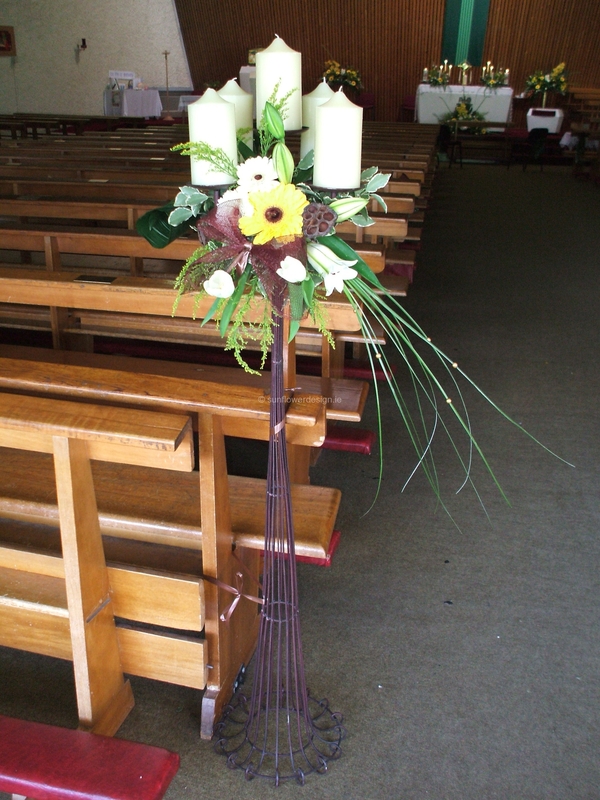 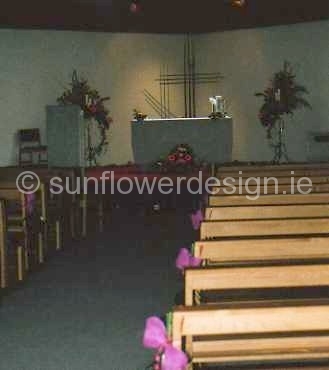 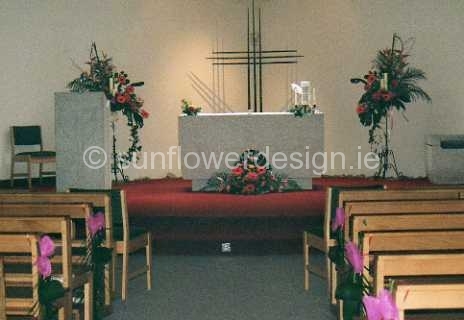 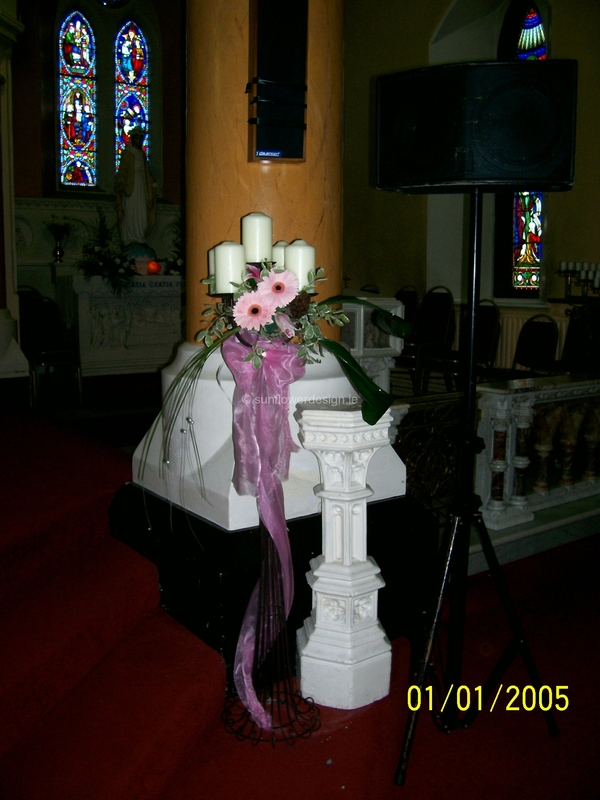 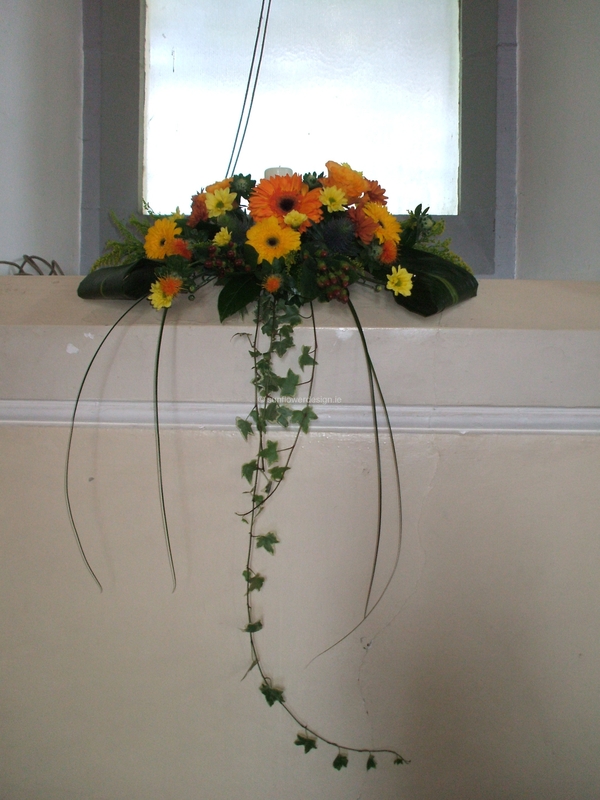 We used Hanging Heliconias and Monstera Leaves in the Church as well as Gerbera which were the focal Flower for the whole wedding as they are a favourite of Niamhs. 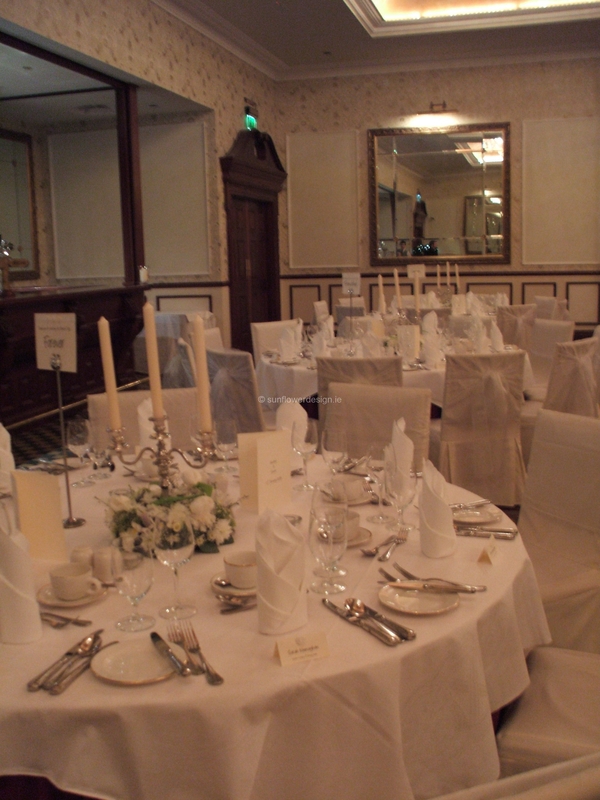 A Big Thankyou to Alison Lynch for her help with the Table Centers and Well Done to Vivienne Geraghty for a beautiful job dressing the room. 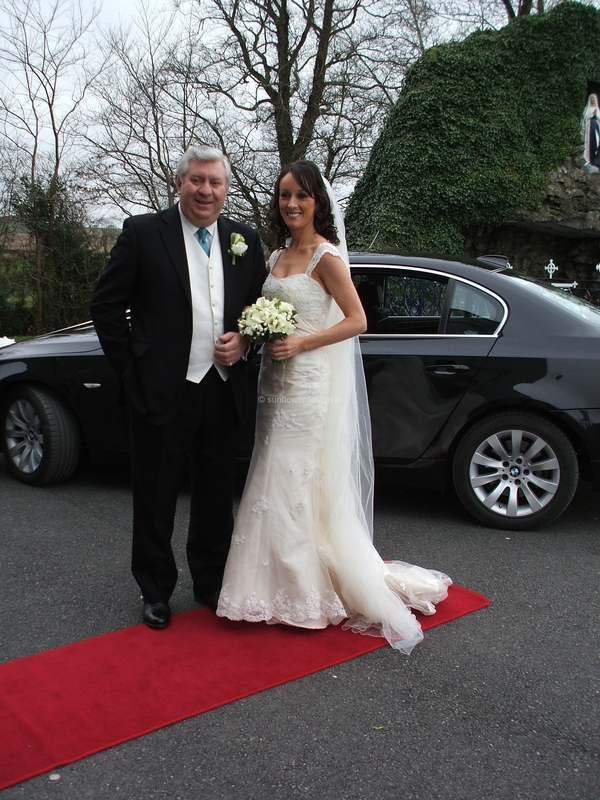 Also Thankyou to Denise at the Spa for her enthusiasm and great feedback” – Eileen. 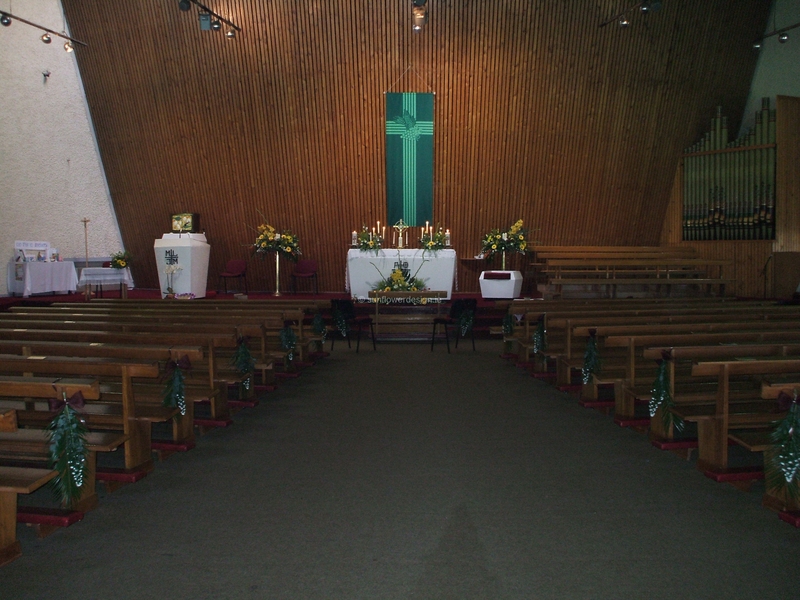 Church of the Assumption, The Heath. 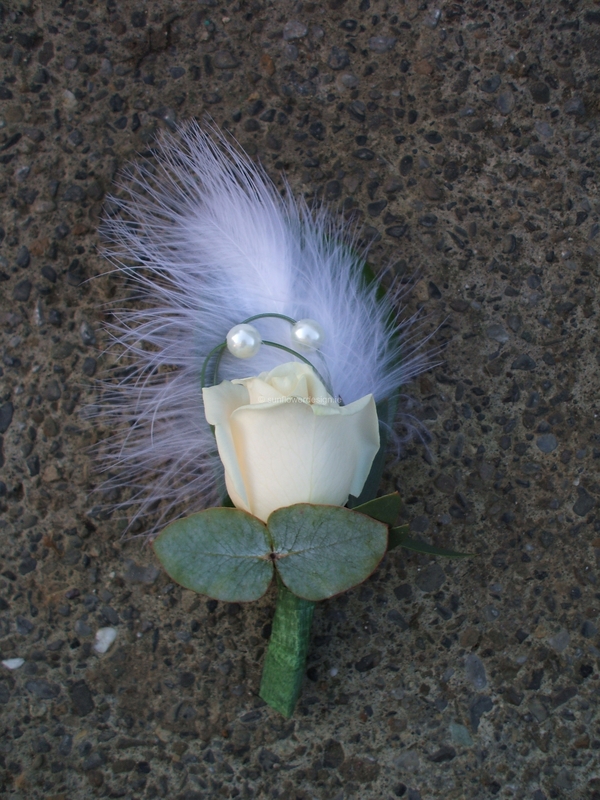 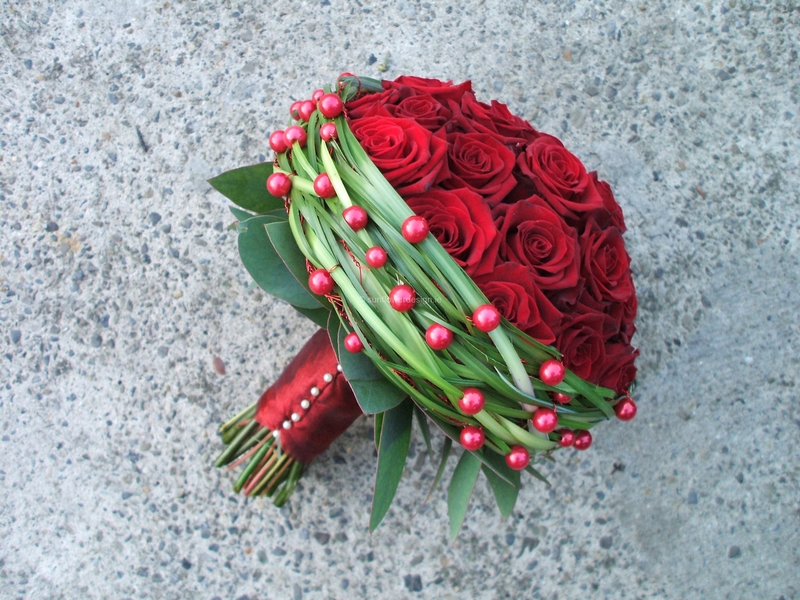 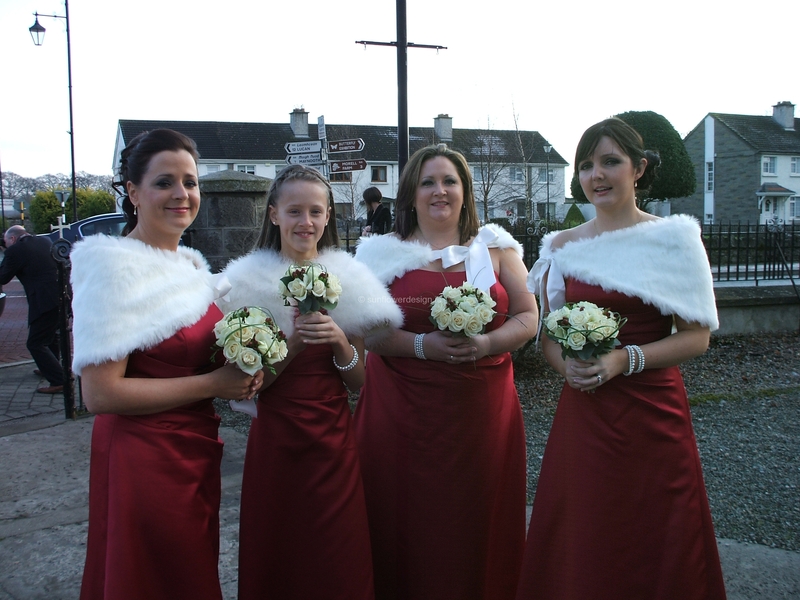 Weddings around Christmas can be problematic due to the fact that the Holland Market shuts down for several days and Fresh flowers will be in short supply, indeed all of the flowers for Eavan’s wedding came in to the country on the 23rd of December – a full 11 days before the wedding! 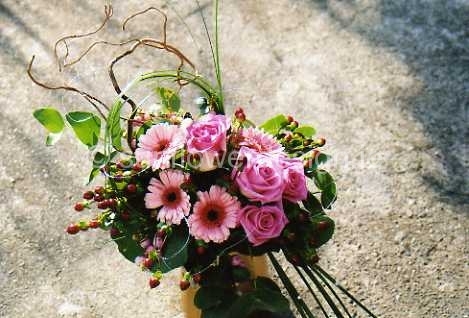 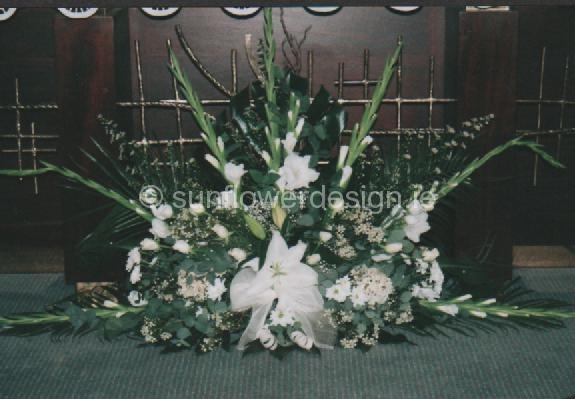 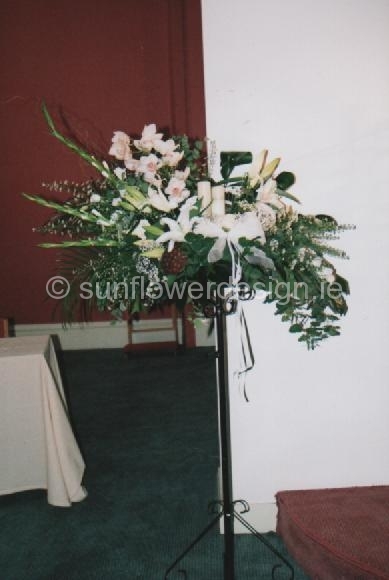 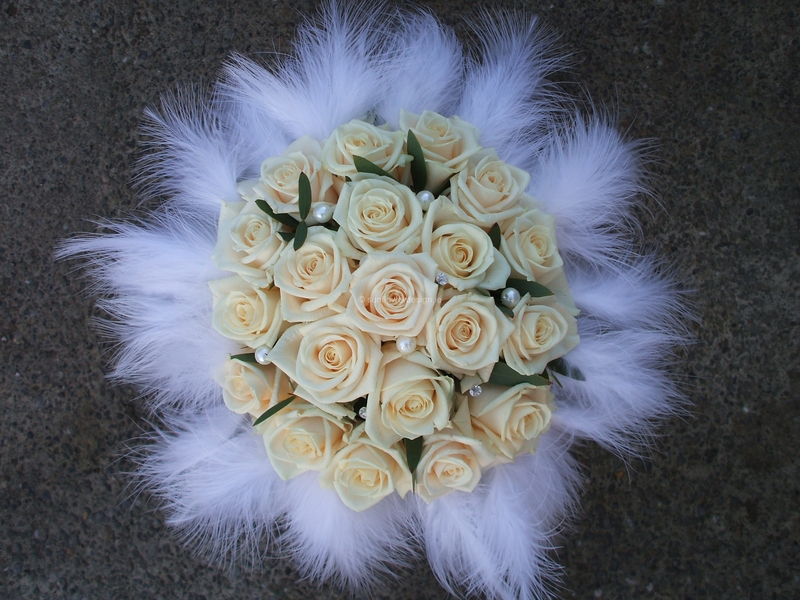 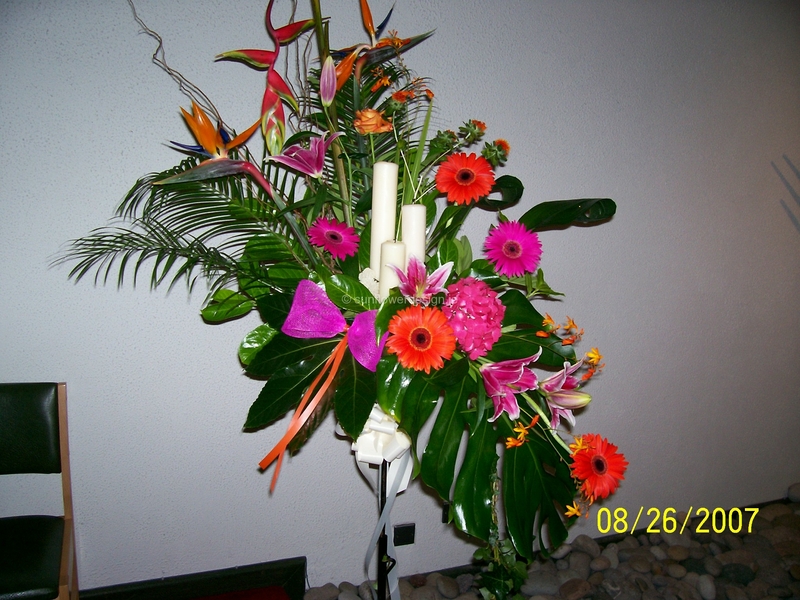 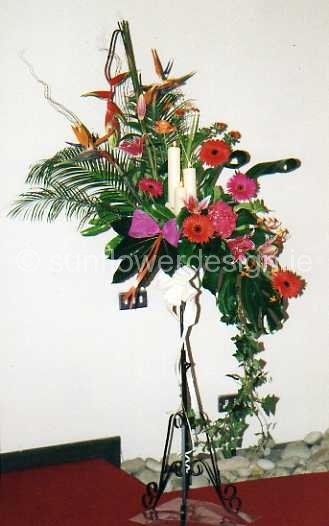 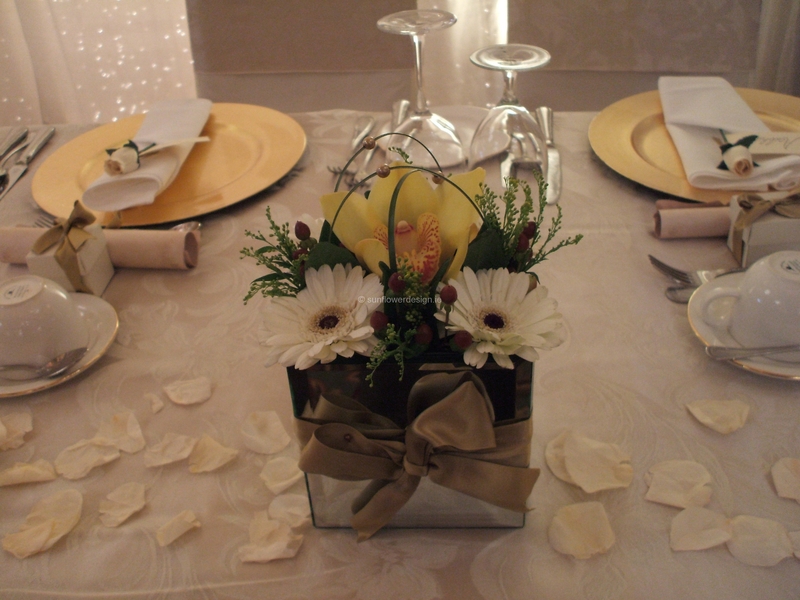 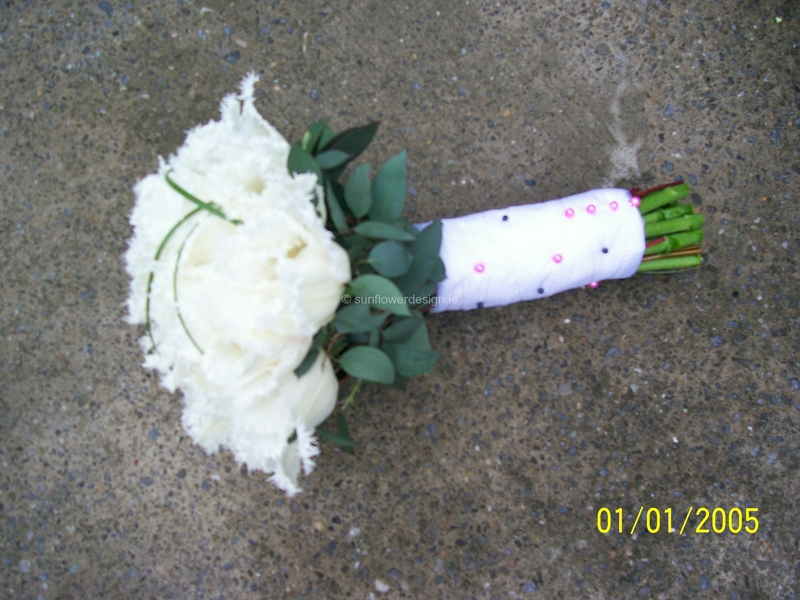 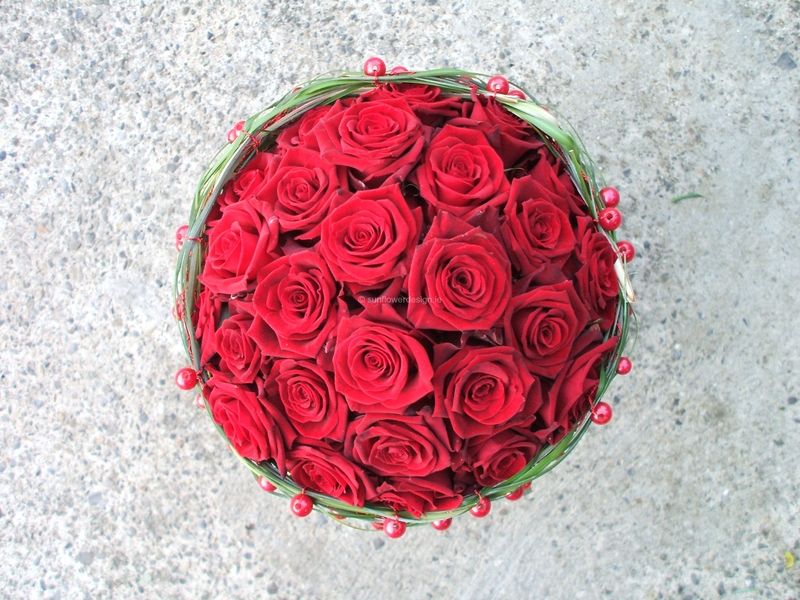 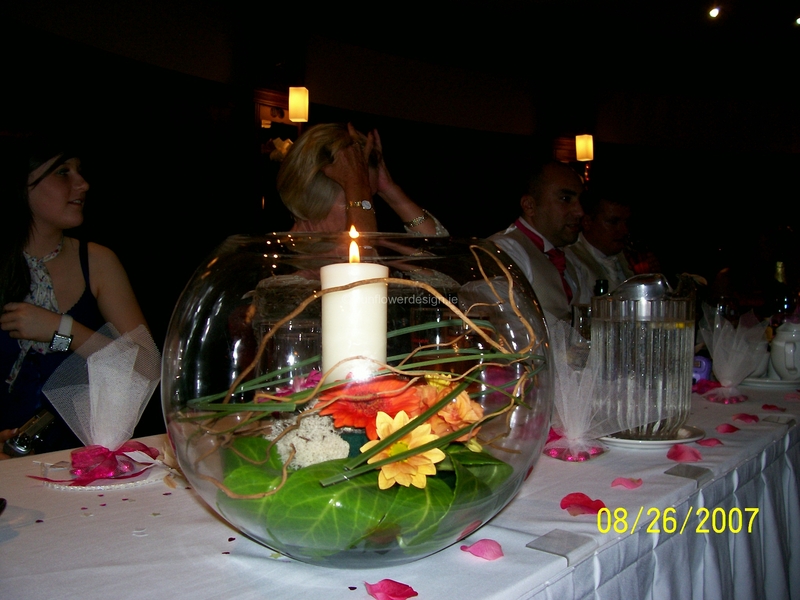 Knowing this would be the case, we had to be very carefull with what flowers we ordered and with caring for them during this time to insure they would still look great on the day. 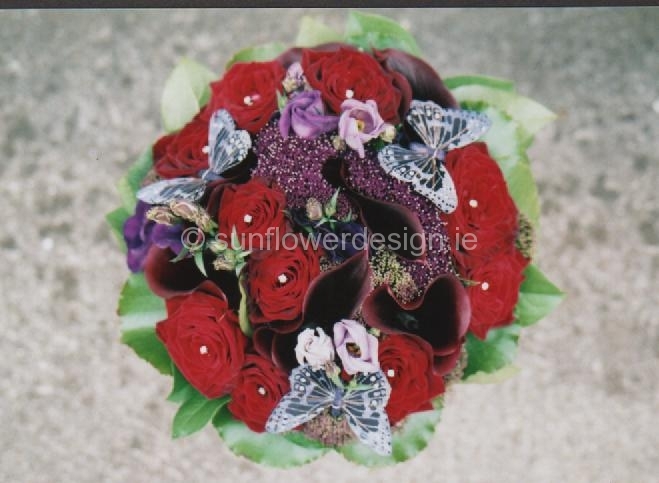 At the initial consultation Eavan and I discussed the various options for flowers that would last well during this period and other options – just in case! 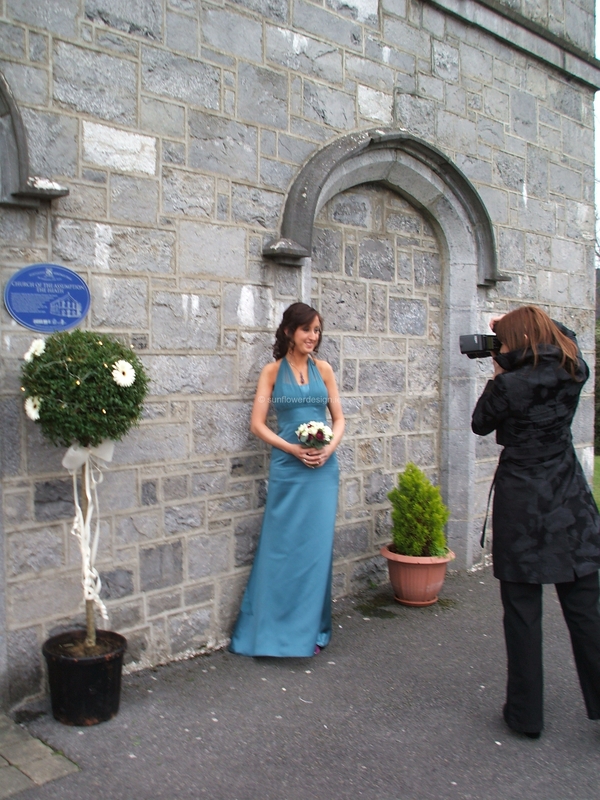 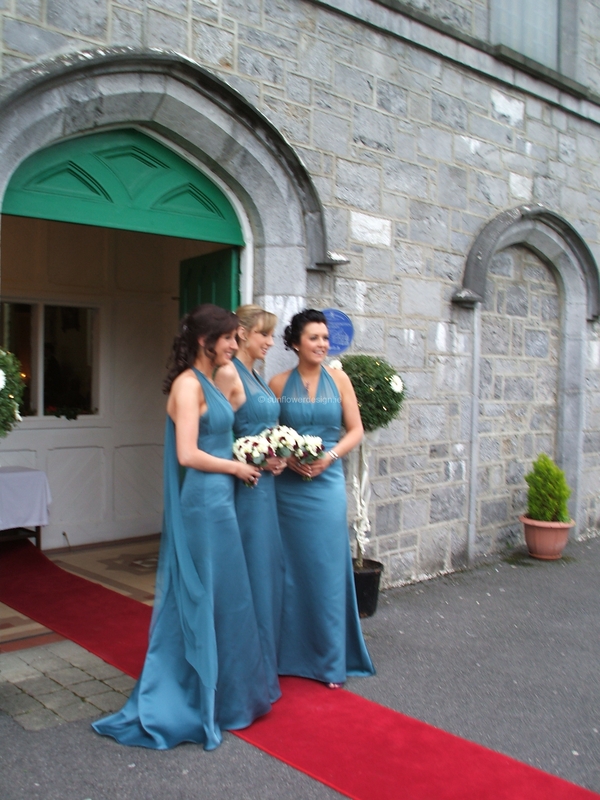 Eavan’s Bridesmaids were in Teal which is not a natural colour and therefor there are no flowers that will match this exactly. 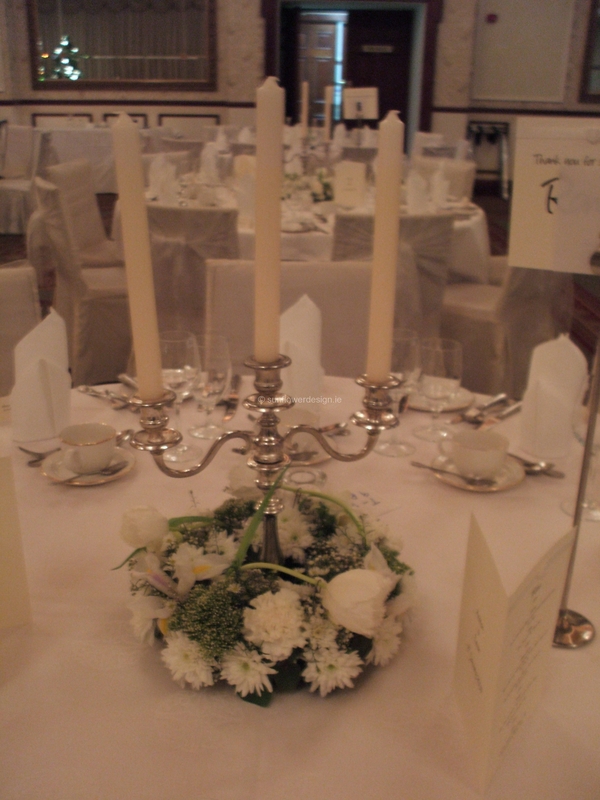 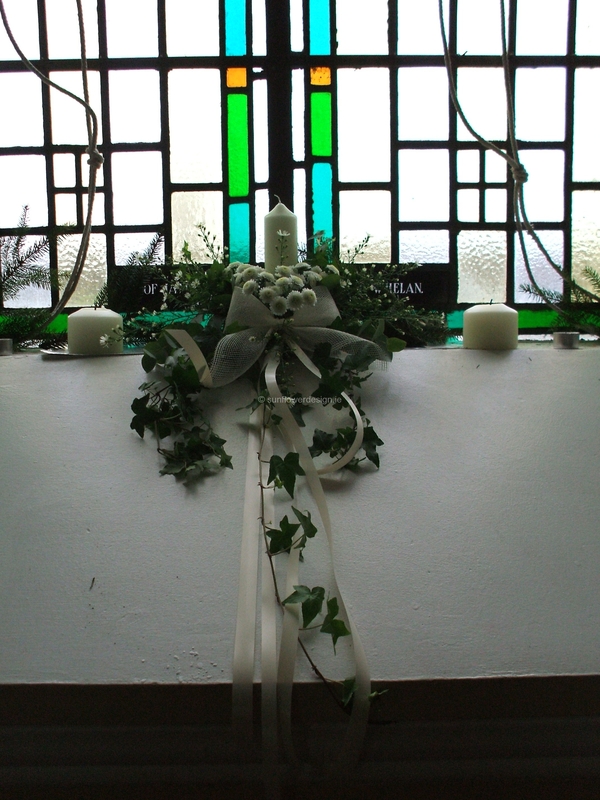 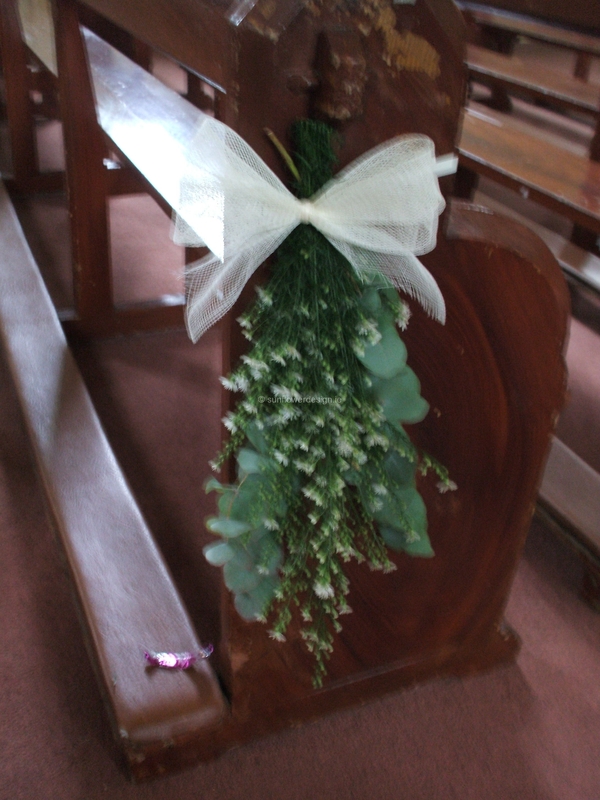 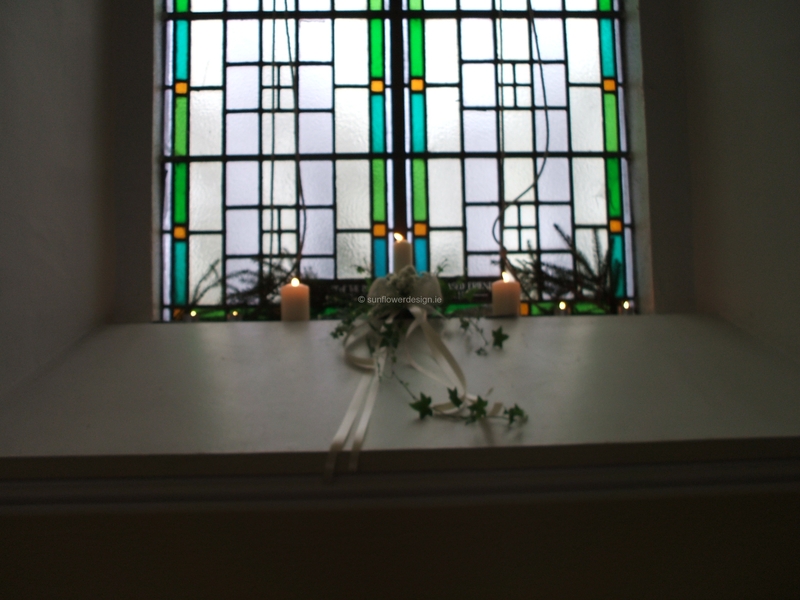 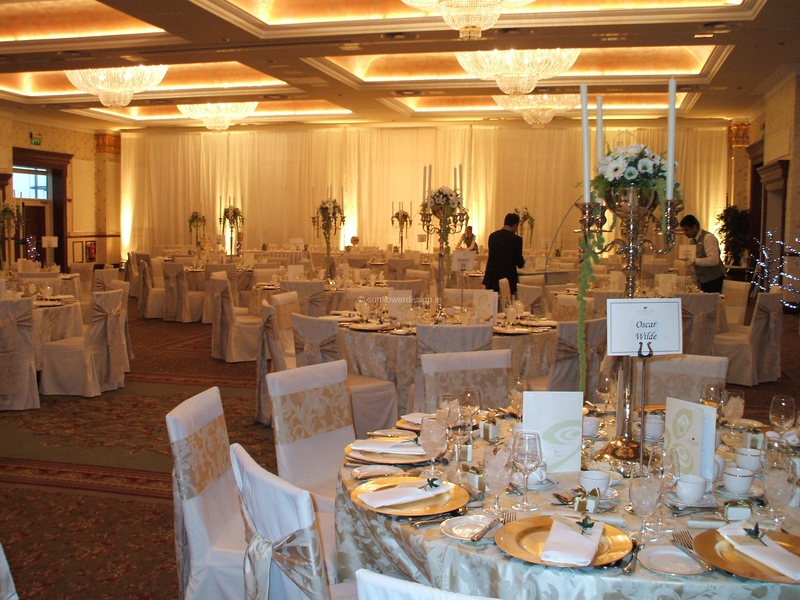 Eavan liked the crisp, classic winter look of Ivories and Whites, warmed up with a little greenery and lots of candles. 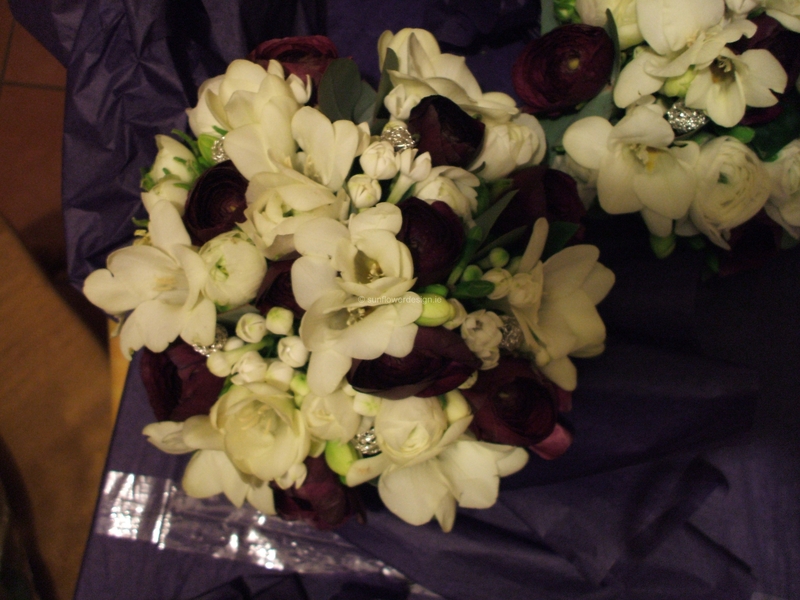 She decided to go for a mixture of Ivory Callas, Bouvardia and Ranunculus for her own bouquet and to add a few Purple Ranunculus and Freesia to the Bridesmaids Bouquets for contrast. 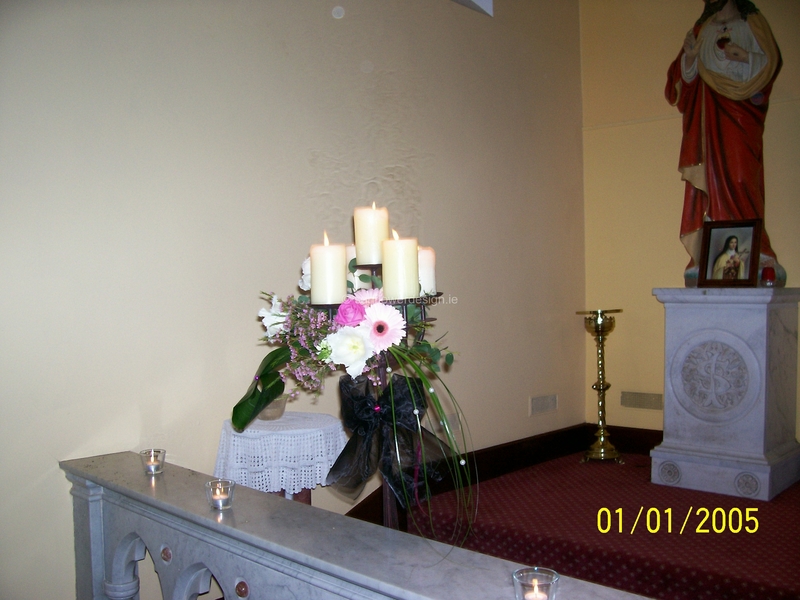 In both the Church and the Hotel, Eavan went with Ivory flowers and lots of Candles for that romantic feel and she fell in love with “Honeymoon” Tulips which we used extensively in the Hotel in particular. 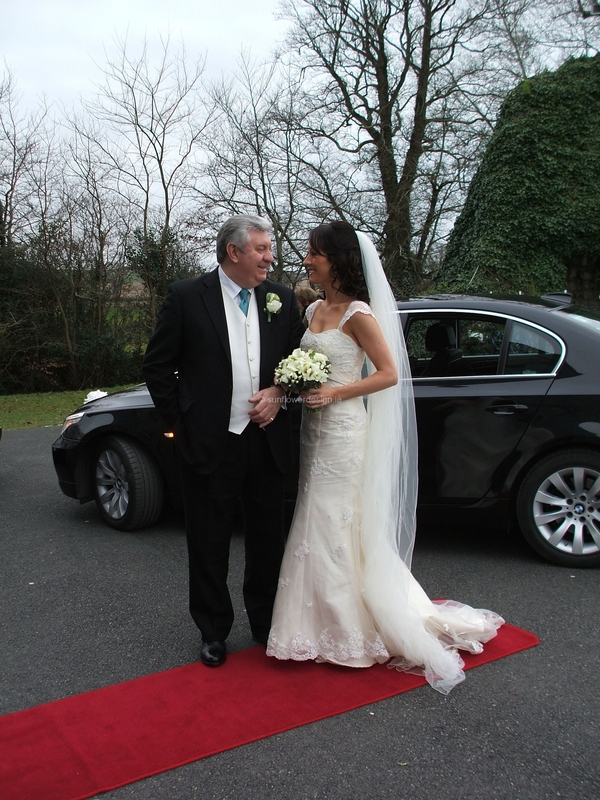 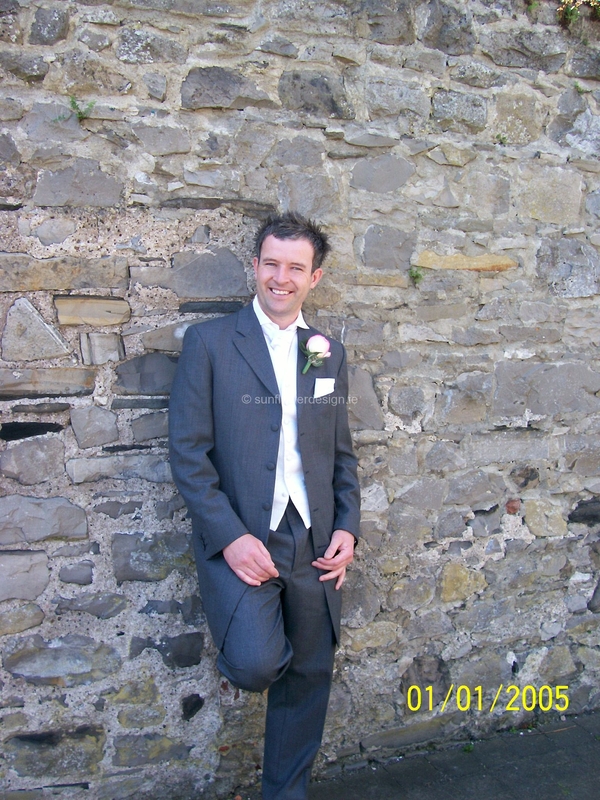 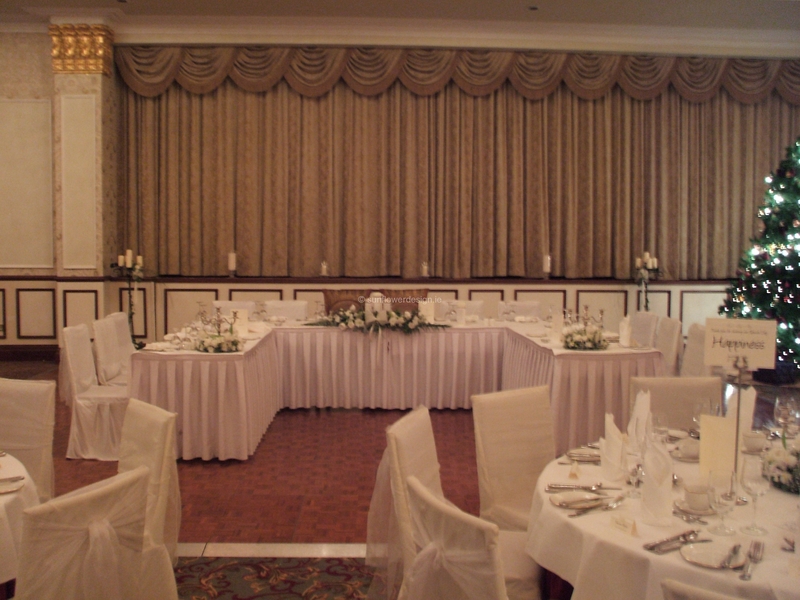 Many thanks to David and all the staff in the Killenarde – couldn’t be more helpful!” – Eileen. 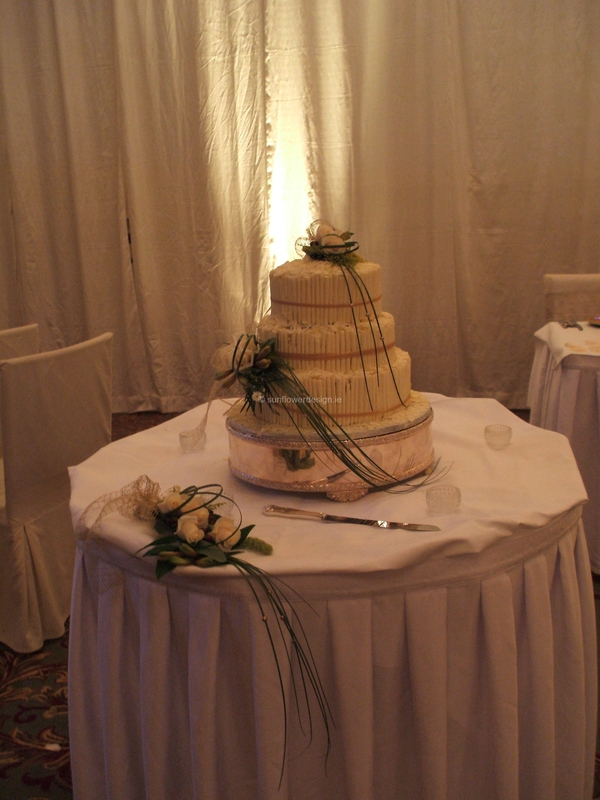 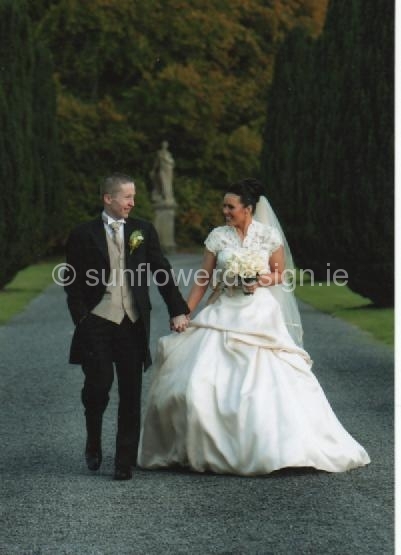 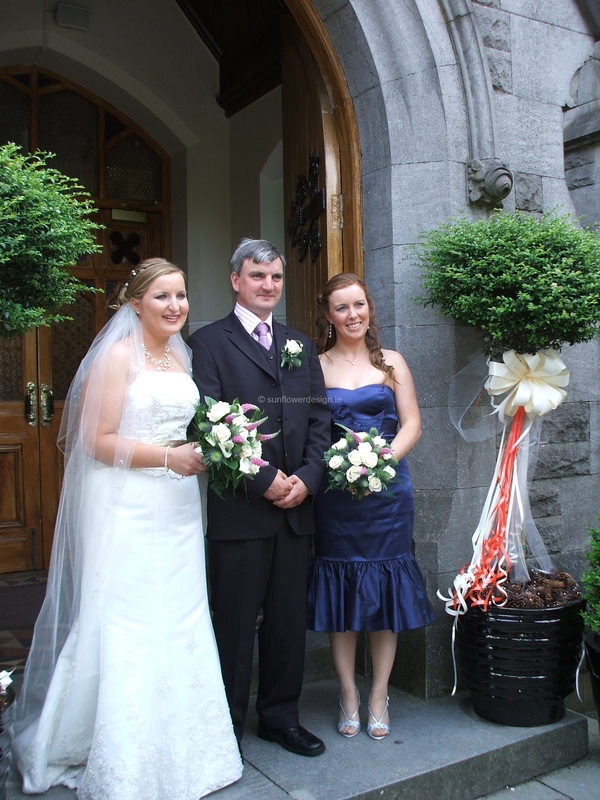 “Aine had a very natural, country style when it came to her flowers. 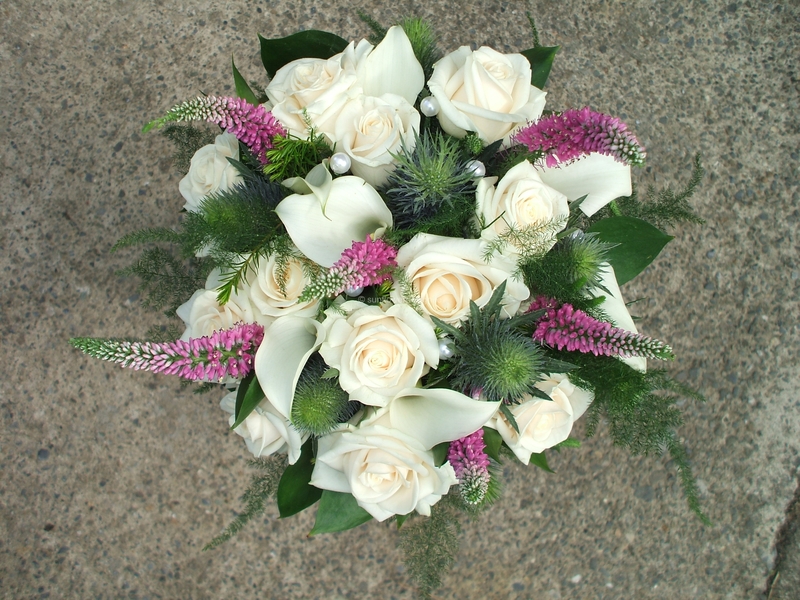 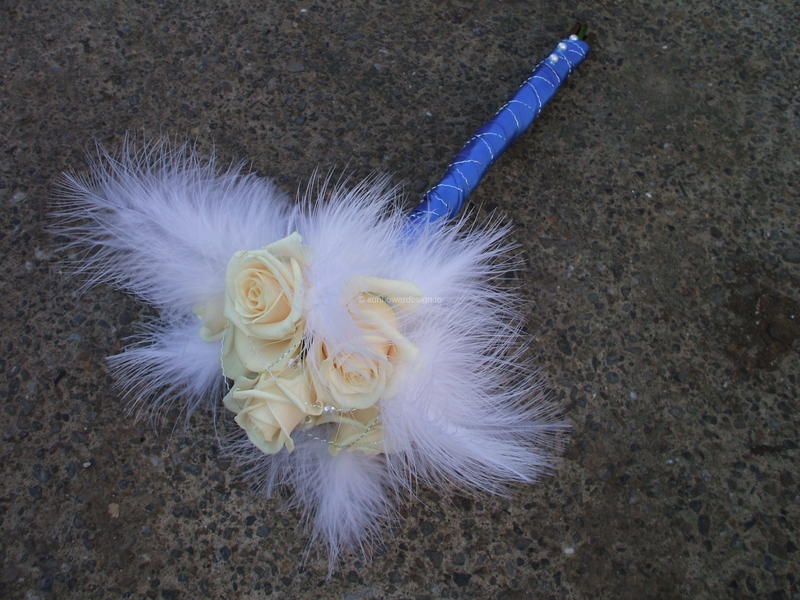 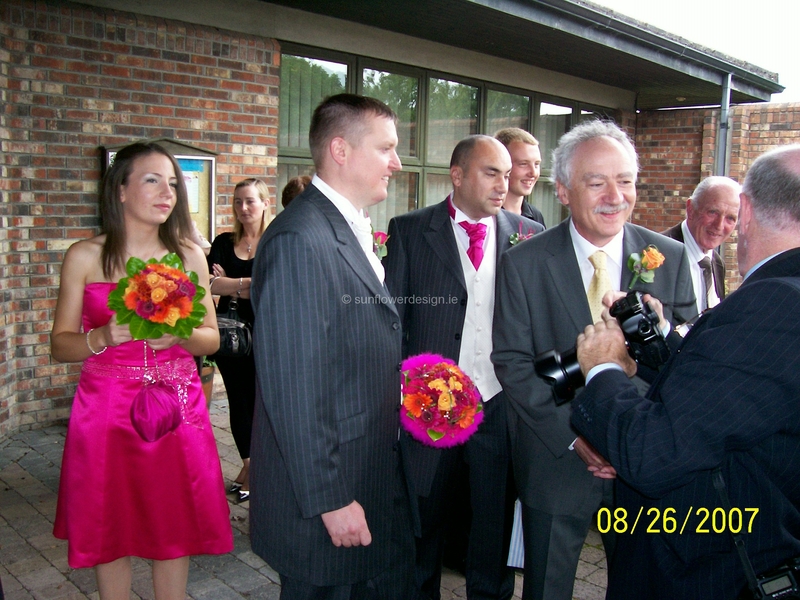 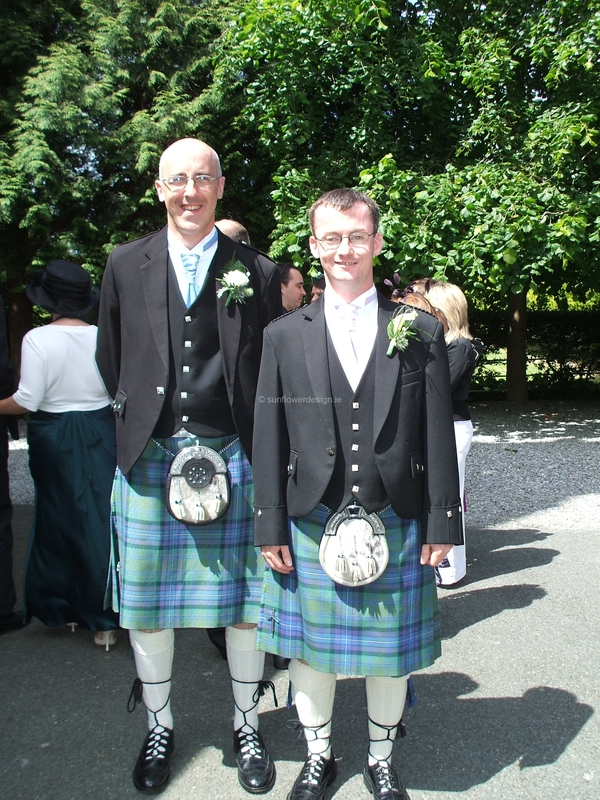 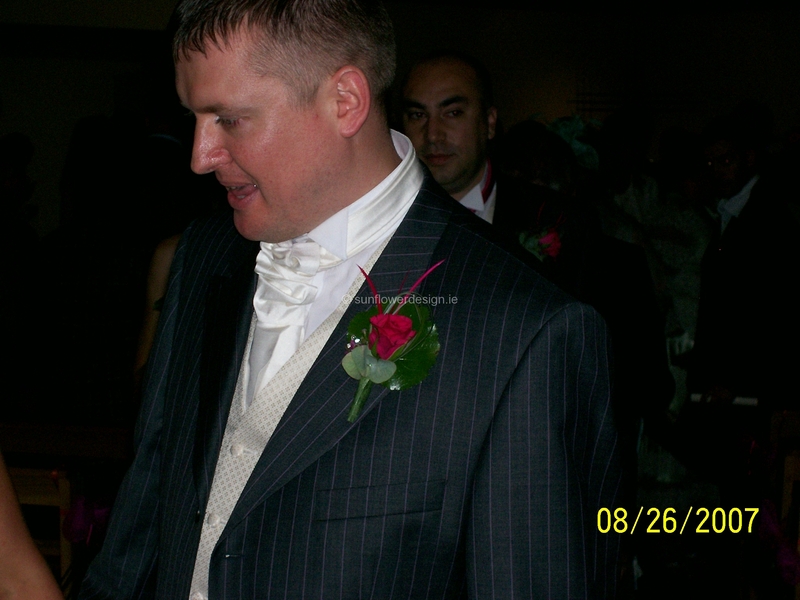 When picking which flowers to use for her own Bouquet she not only wanted to represent Paul’s Scottish roots but also to include flowers that would represent both families heritage, in particular the two Dads. 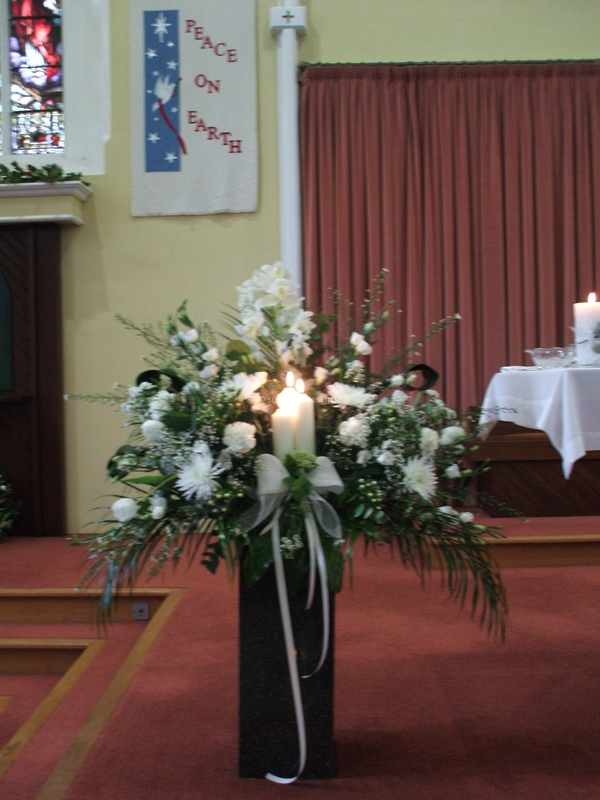 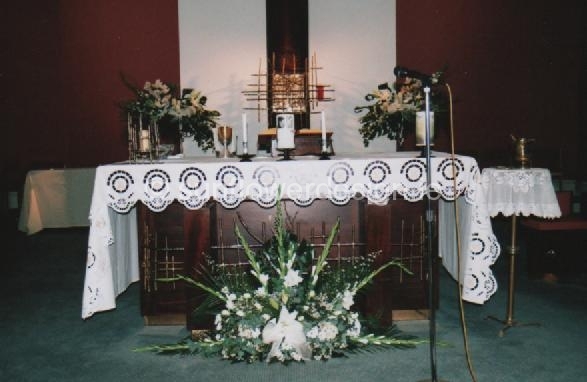 We decided to use Roses, Ivy and Fern as a representation of Aine’s Father and two different types of Thistle to represent Paul’s Dad, as well as doing two Memorial arrangements for the Altar. 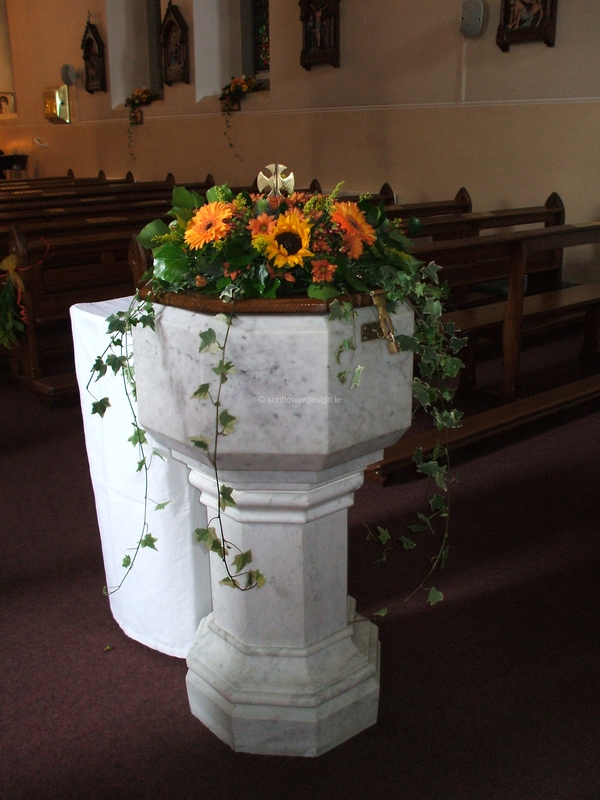 In the church Aine wanted a very natural, country style, using Ivy, Fern, Thistles, and Berries throughout, but she wanted to create a warm, Summer feel too which we achieved using Candles, Sunflowers, Gerbera and Solidago. 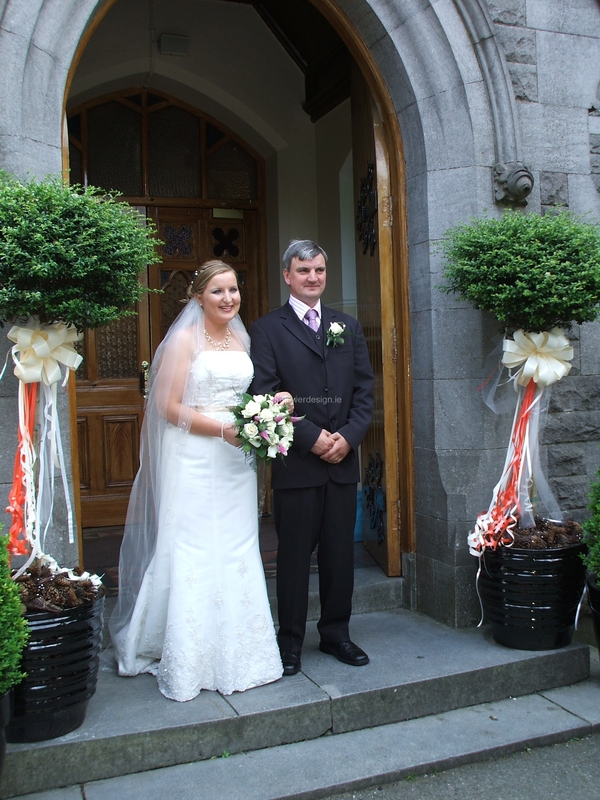 This wedding was a pleasure to work on as it contained some of my favourite flowers and its also a beautiful idea to use flowers that have a meaning to you, as Aine and Paul have done. 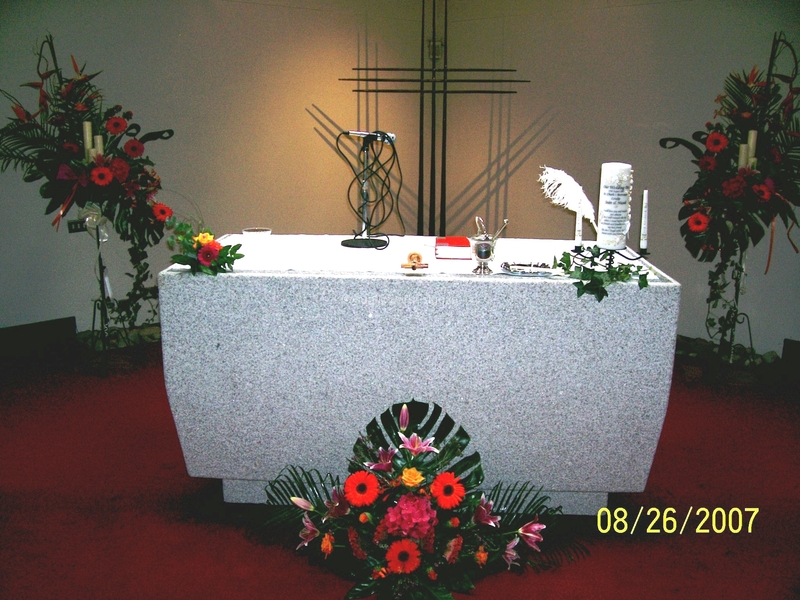 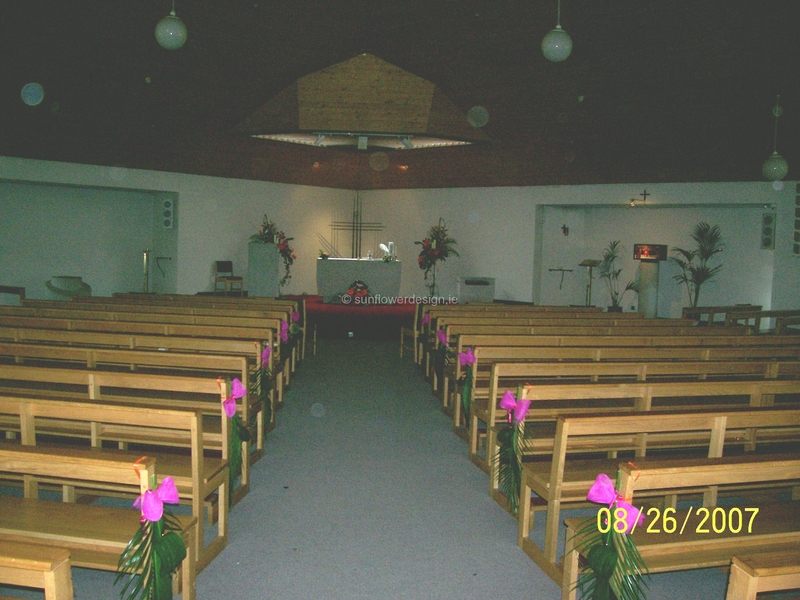 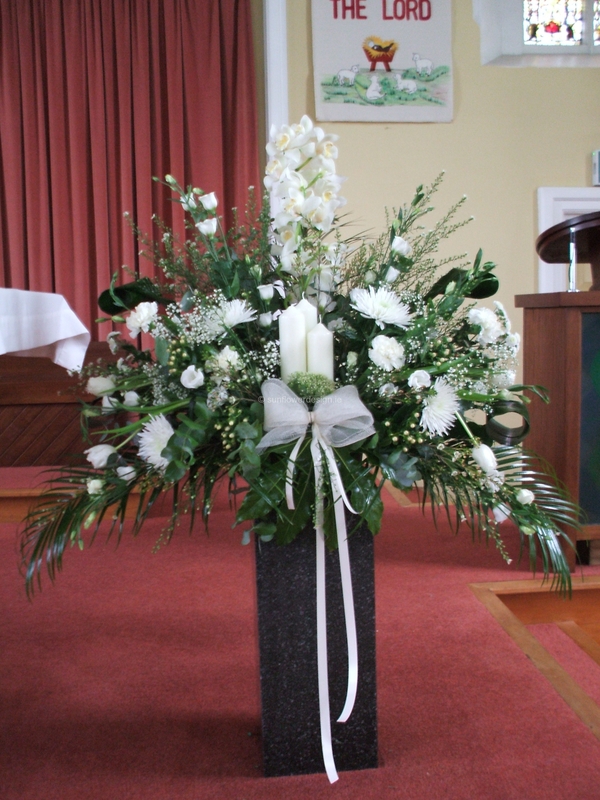 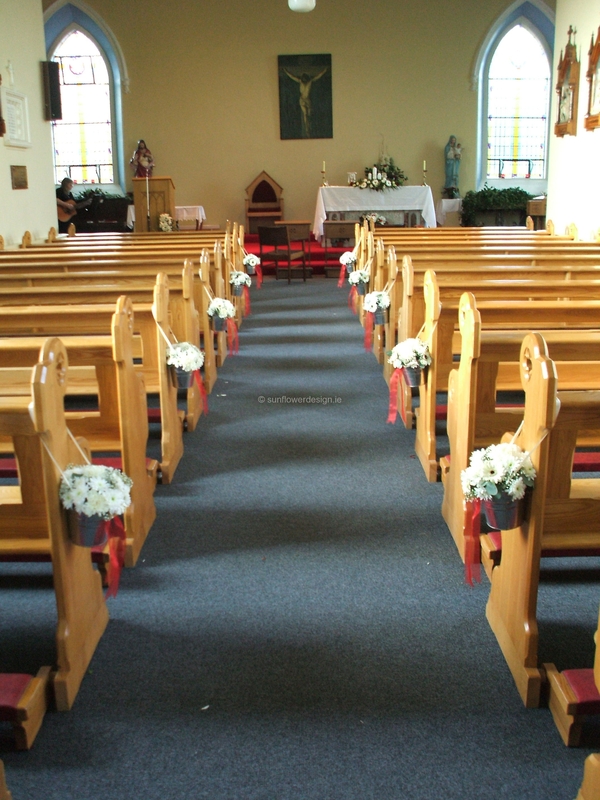 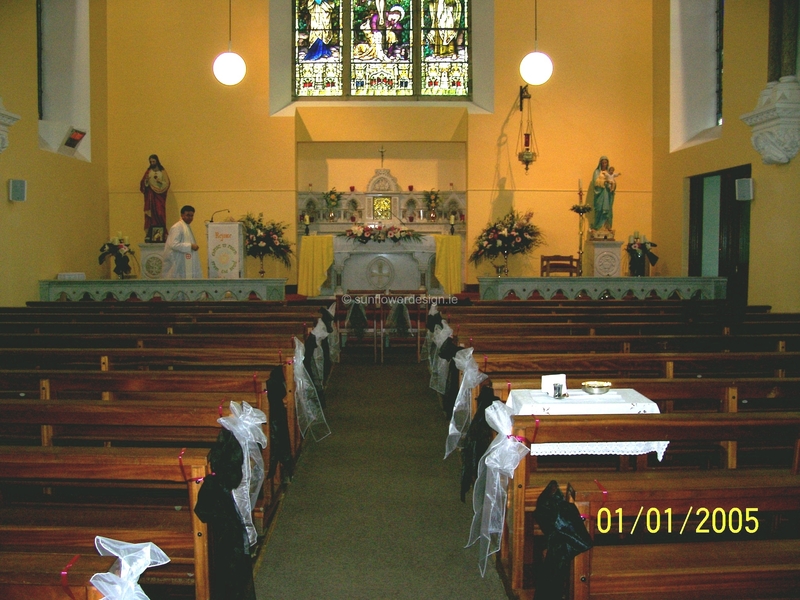 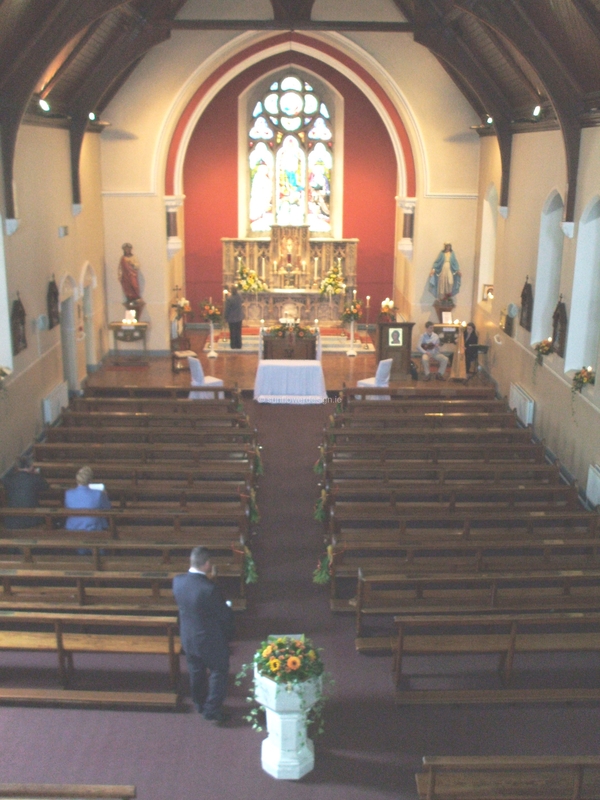 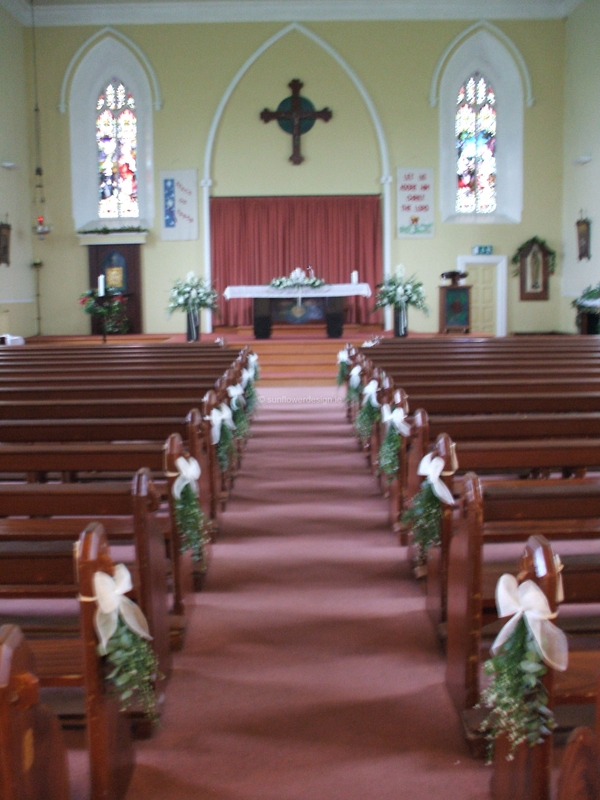 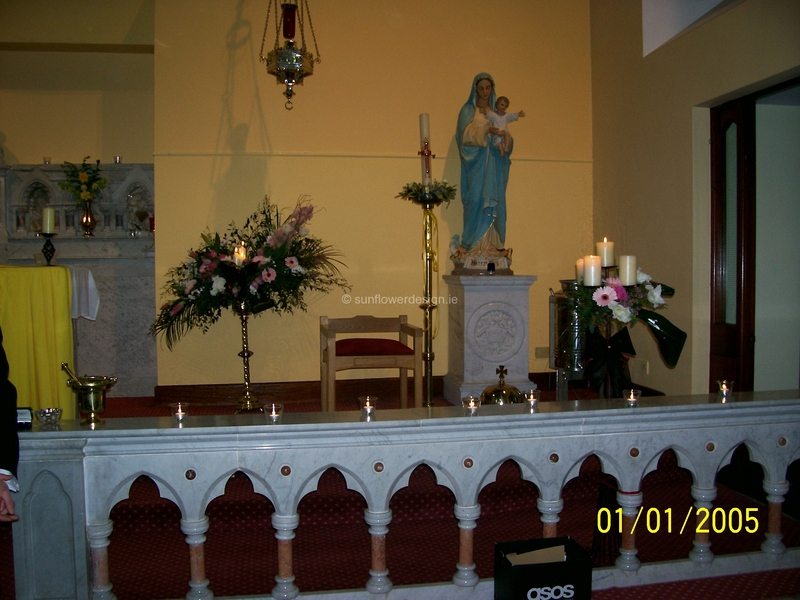 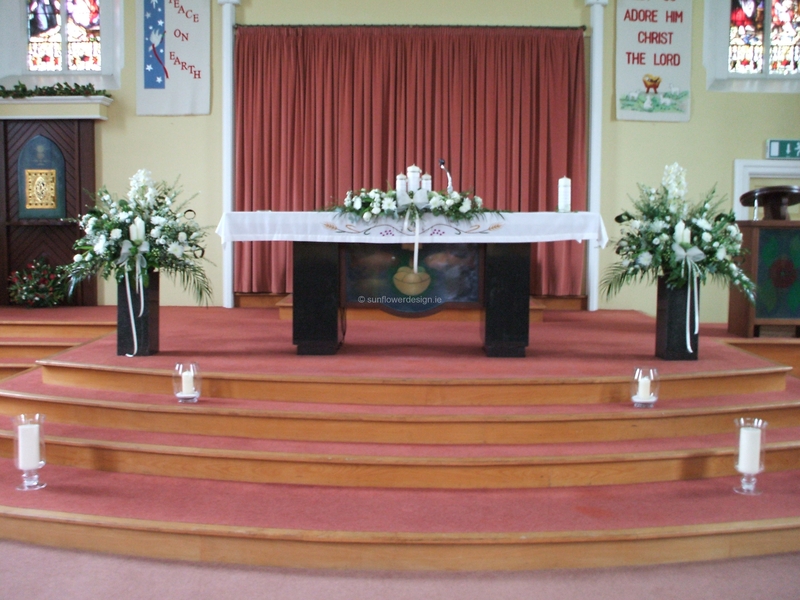 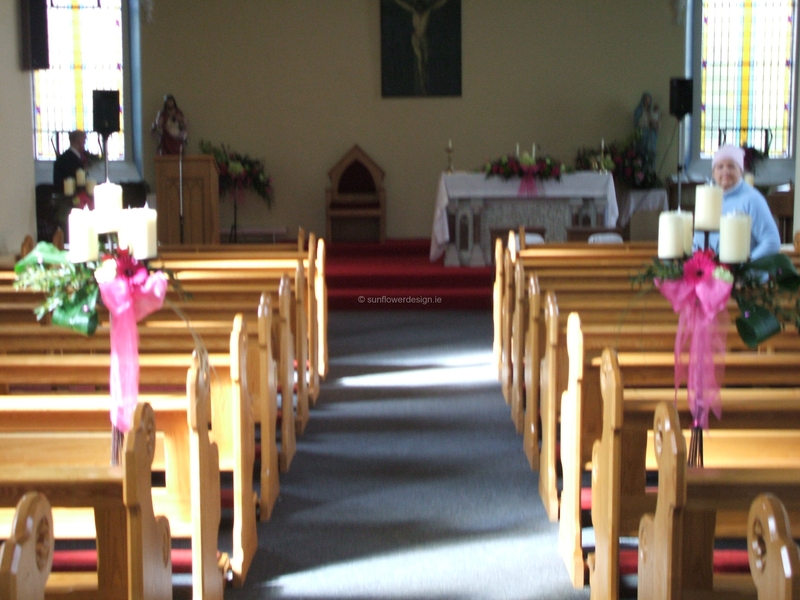 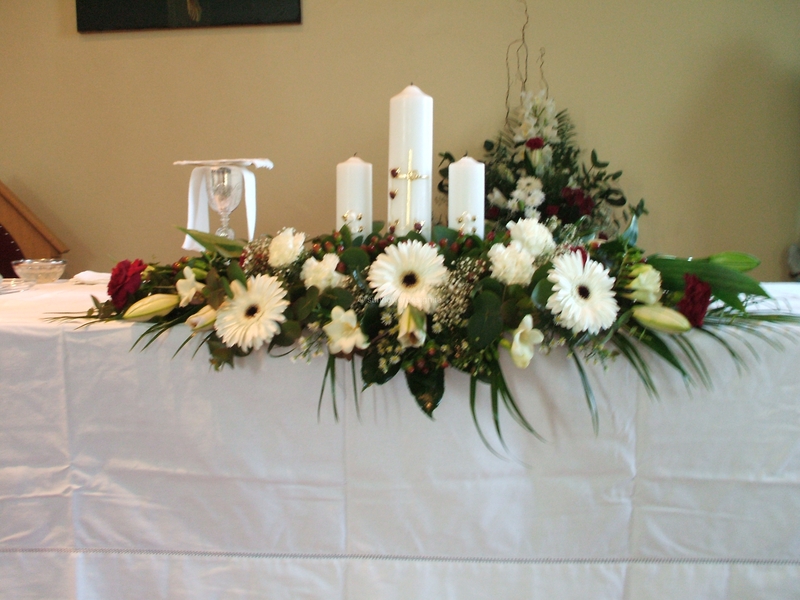 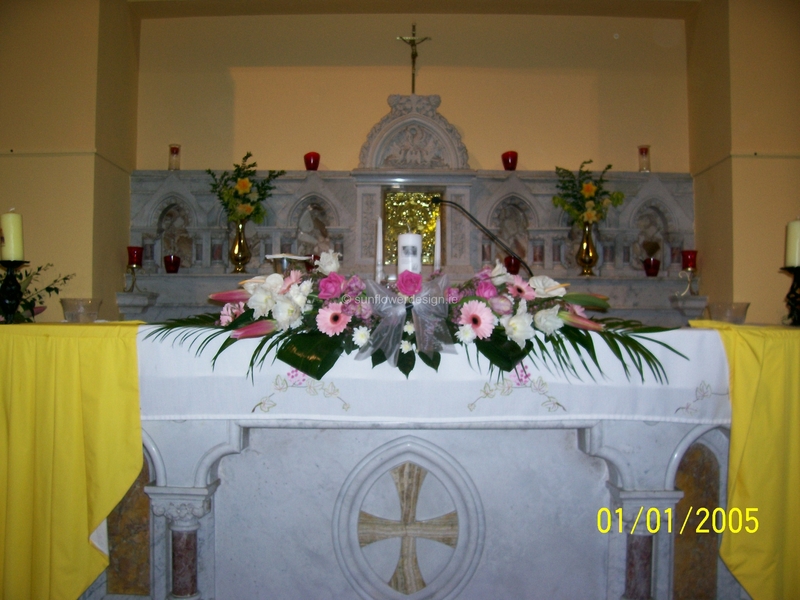 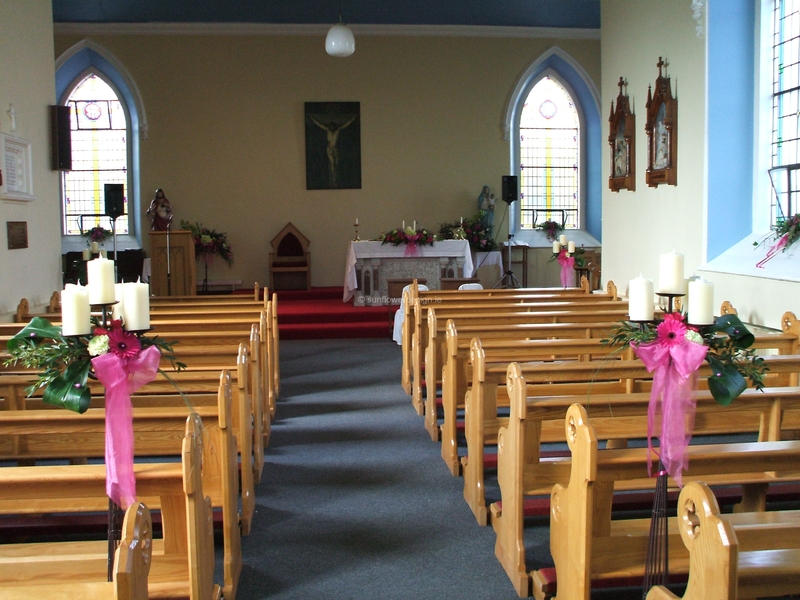 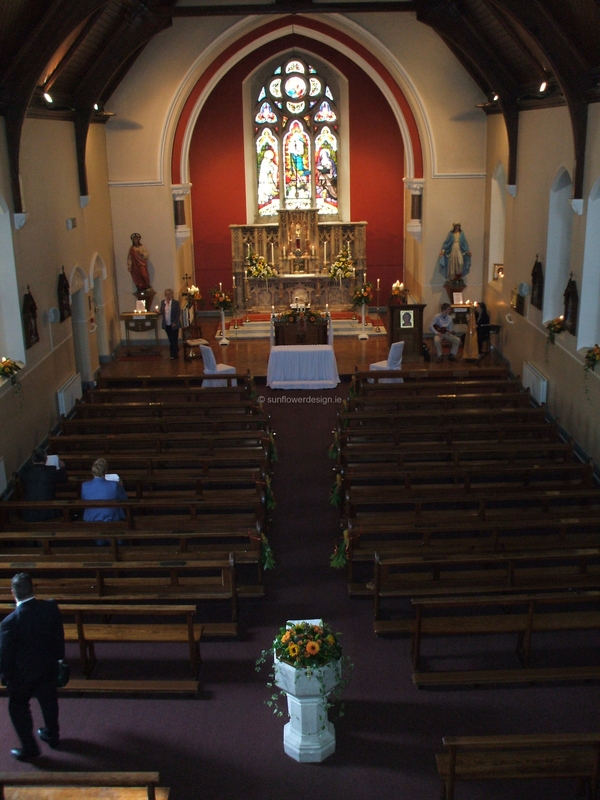 Many thanks to Mary in Porterstown Church for all her help and enthusiasm.” – Eileen. 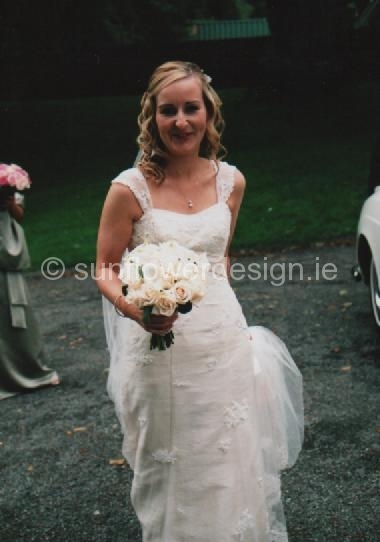 “Sandra’s style was pretty and feminine with a touch of decadence! 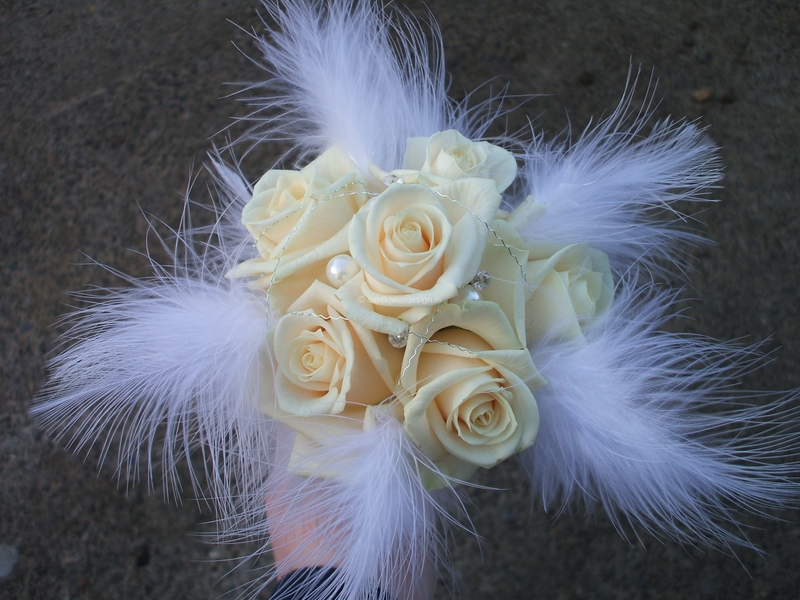 Taking our inspiration from the ruffles at the back of her dress and the colour of the Bridesmaids dresses, we created a soft, romantic, tactile bouquet of mixed peonies and feathers with a hint of sparkle from tiny diamante. 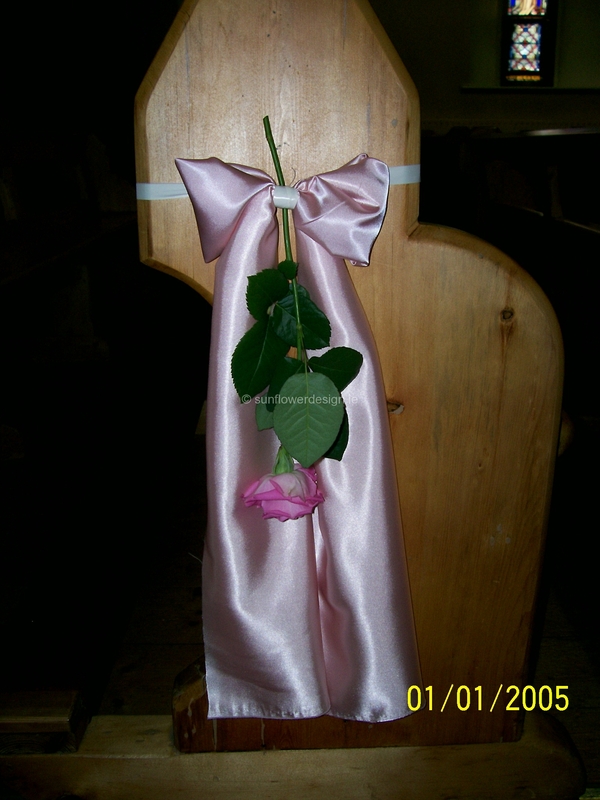 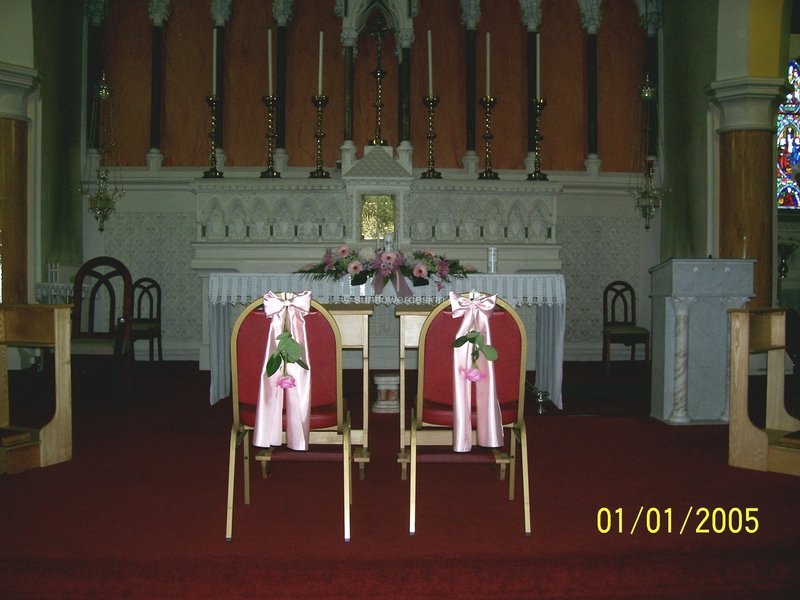 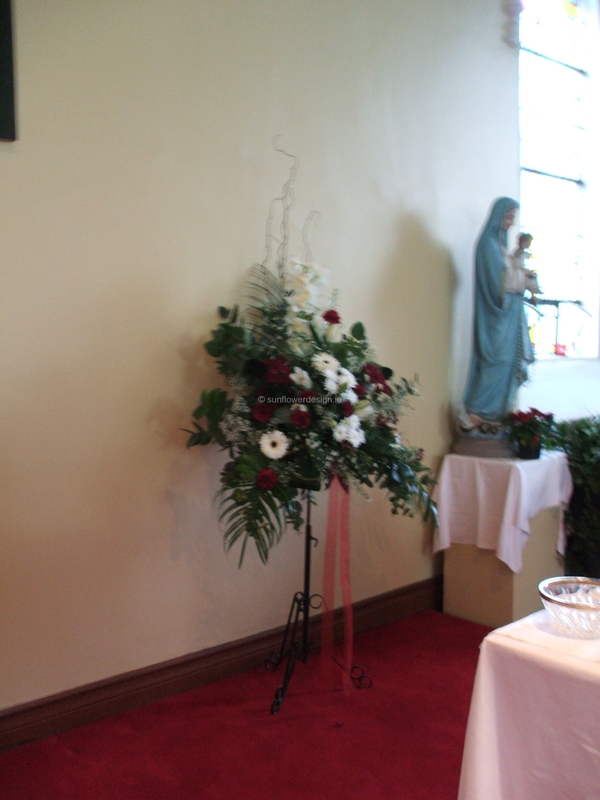 For the bridesmaids we chose a mix of soft pink roses, accentuating this in the church with a simple Pew Decoration made from a single Aqua Rose and Satin fabric from the Bridesmaids Dresses. 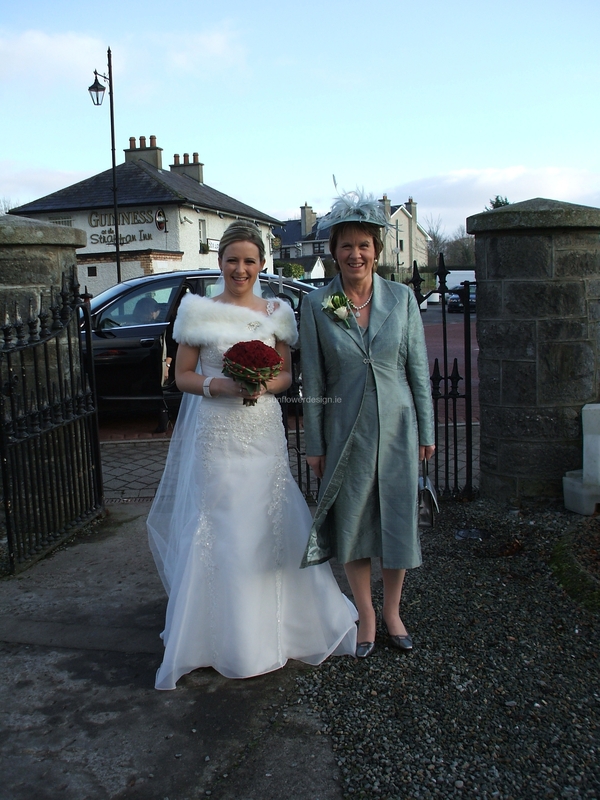 The beautiful weather on the day was the icing on the cake!” – Eileen. 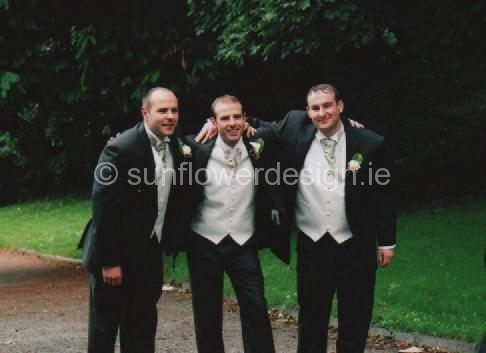 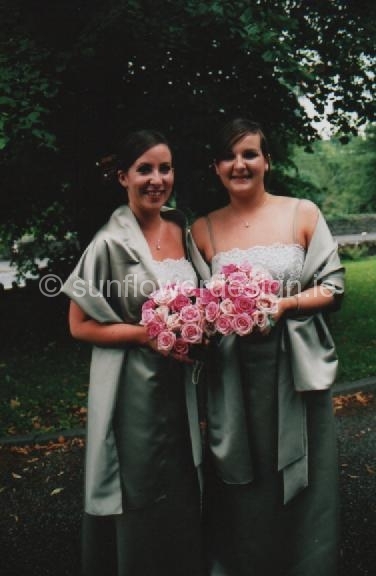 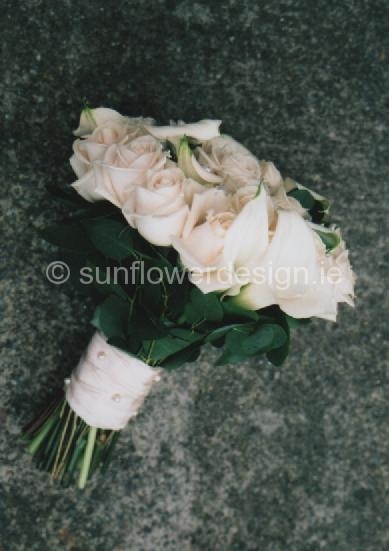 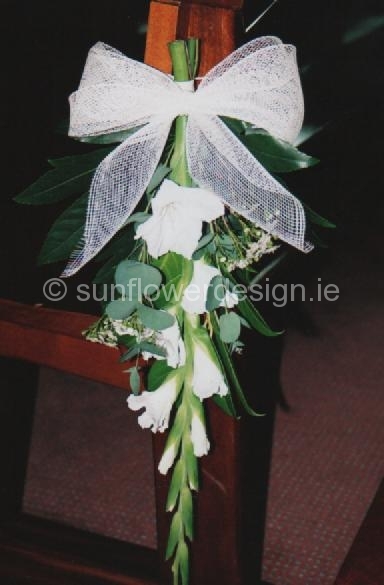 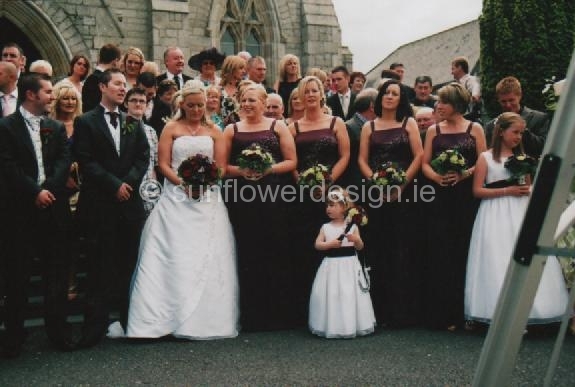 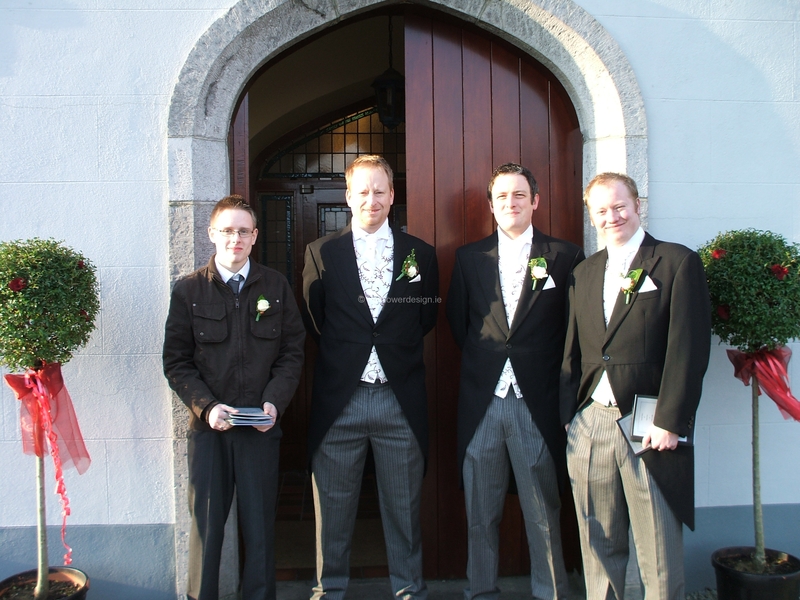 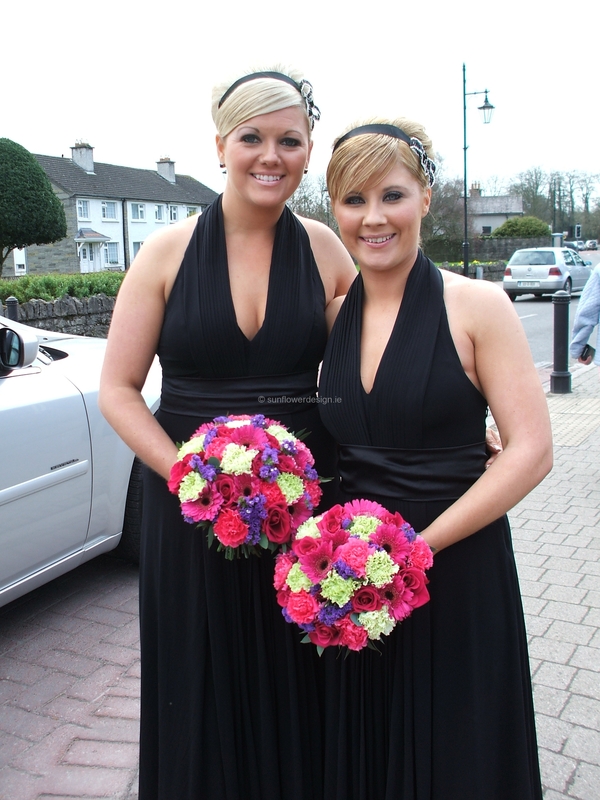 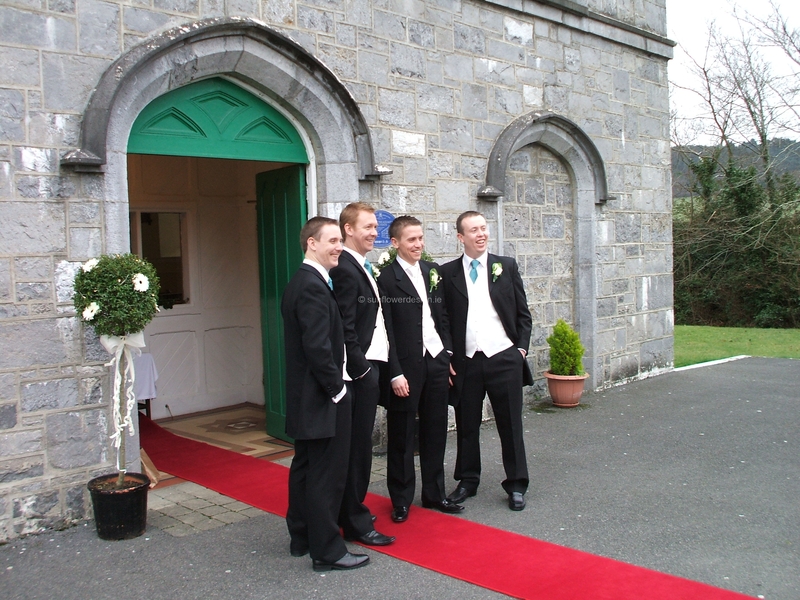 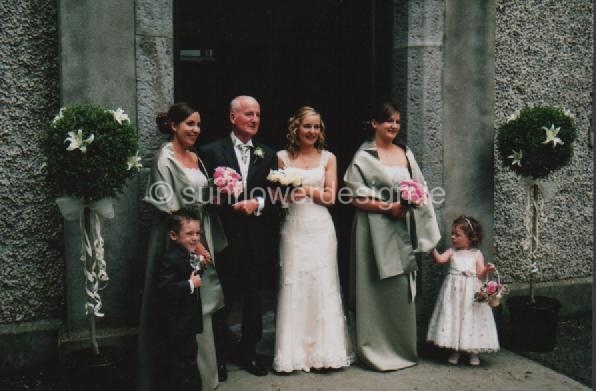 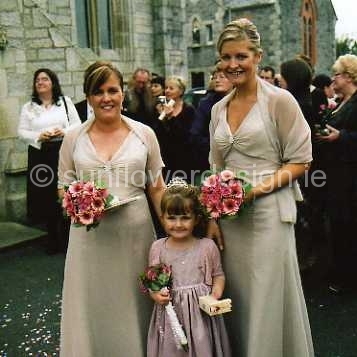 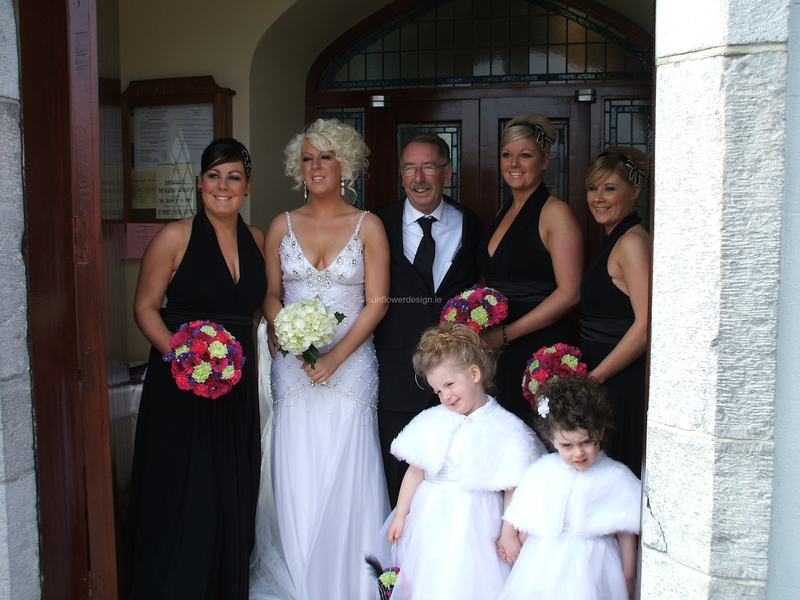 “As Orla’s bridesmaids were wearing black dresses, we really had a blank canvas when it came to the flowers. 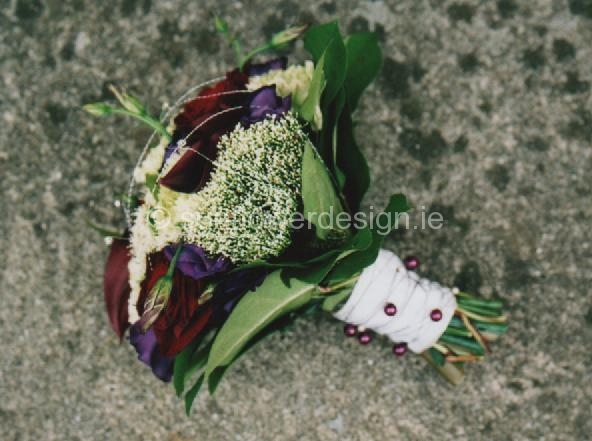 Orla loved the idea of mixing strong, bright colours for contrast against the black but fell in love with a very simple posy of Hydrangeas for herself. 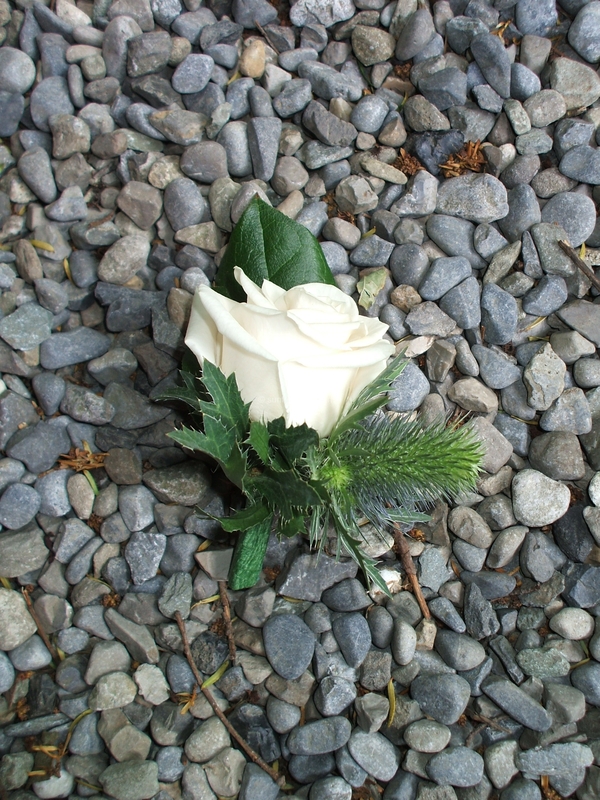 As hydrangeas don’t last well out of water and March is right at the edge of their season of availability, we knew they may not be strong enough to last the day, so we discussed this with her and made her a “Stunt Double” (!) 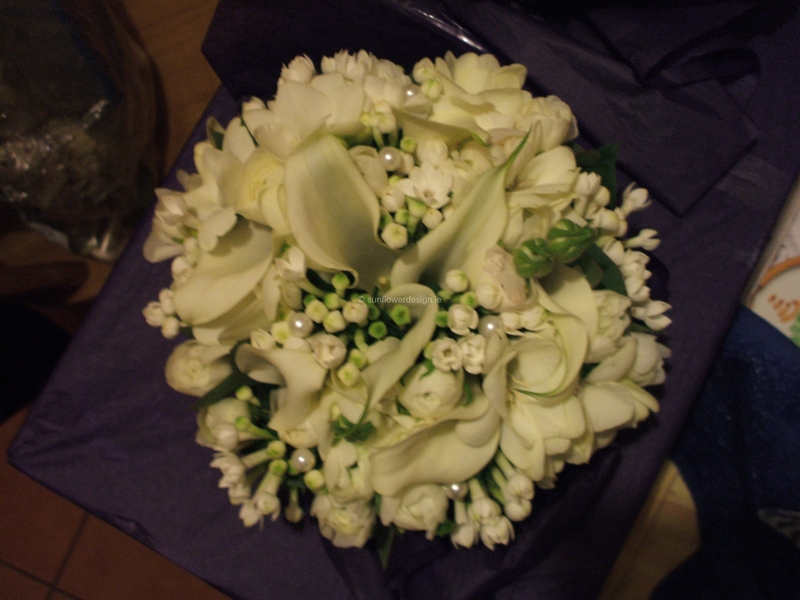 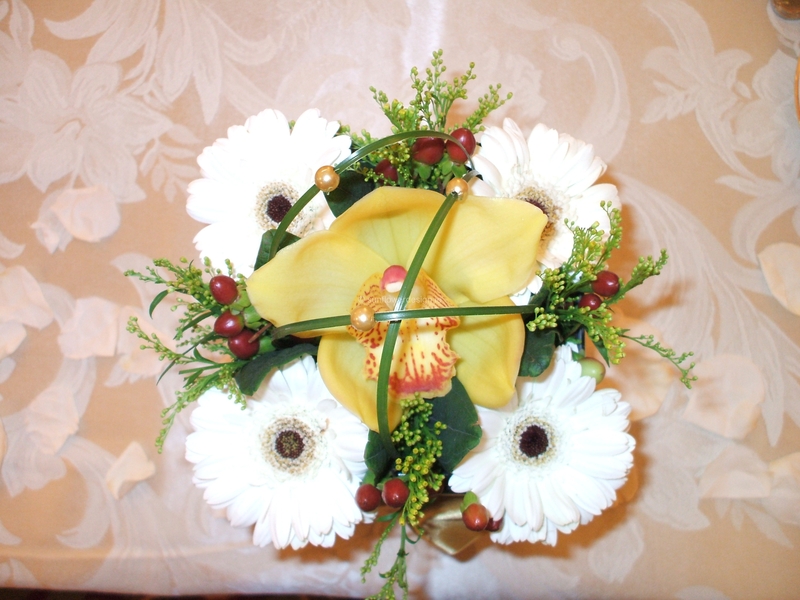 Bouquet which was left at the hotel as a backup plan should her own Bouquet start to droop. 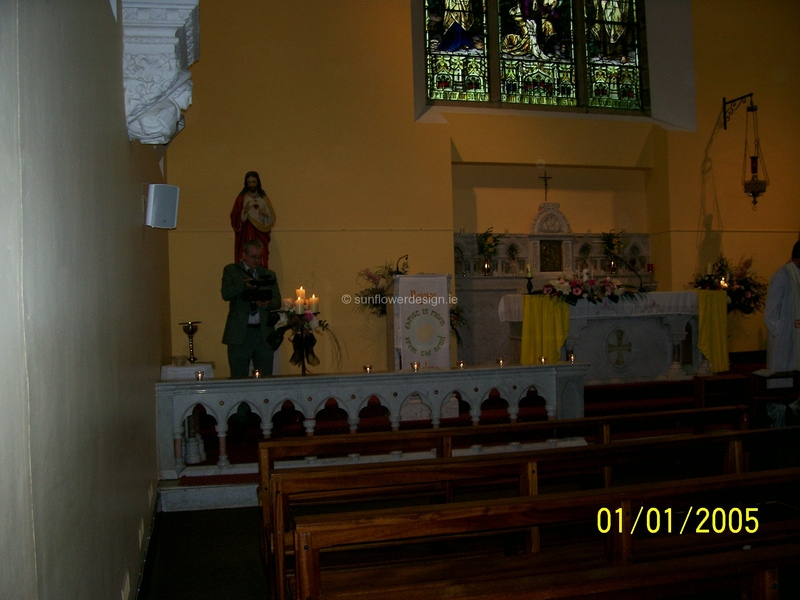 In the Church, real candles are not permitted so we used battery operated ones inserted into our own real ones which could then be lit in Barberstown for the evening. 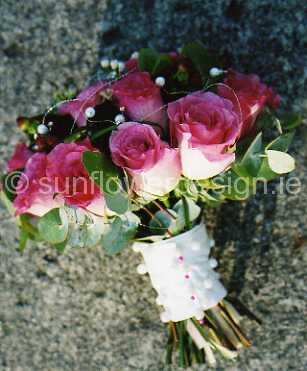 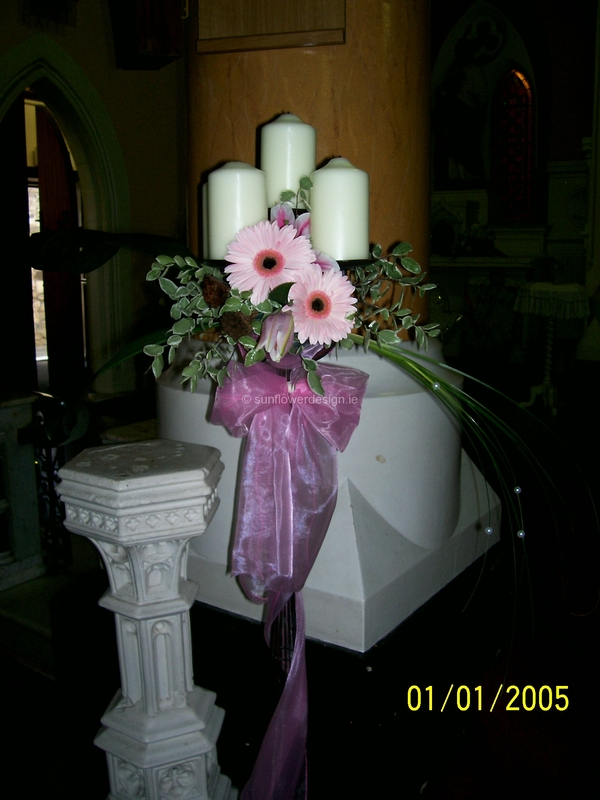 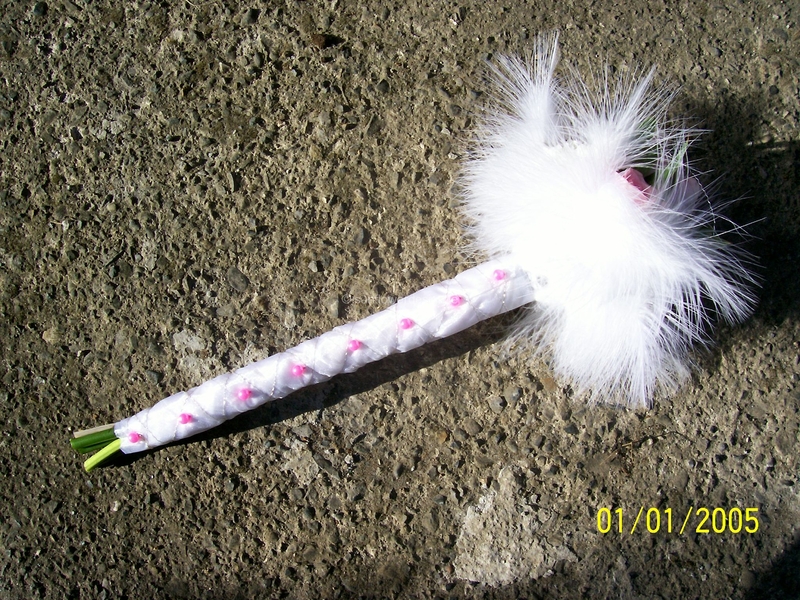 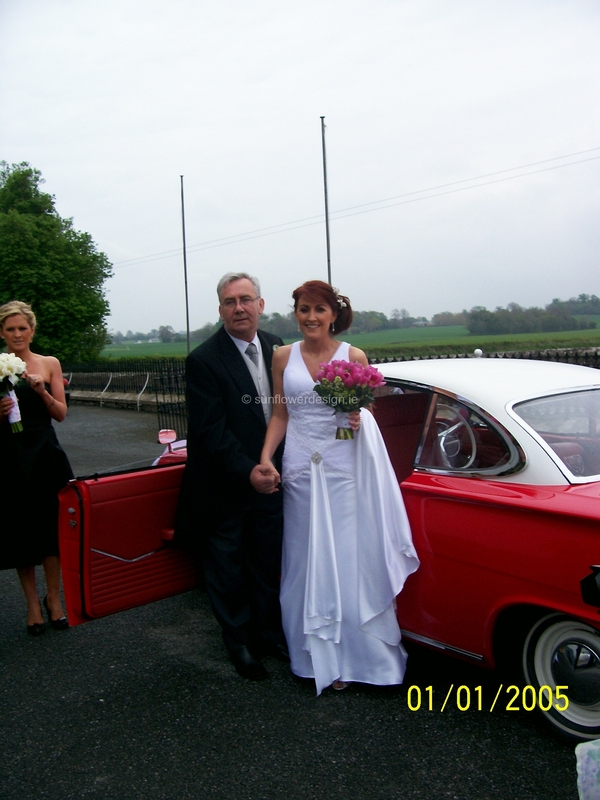 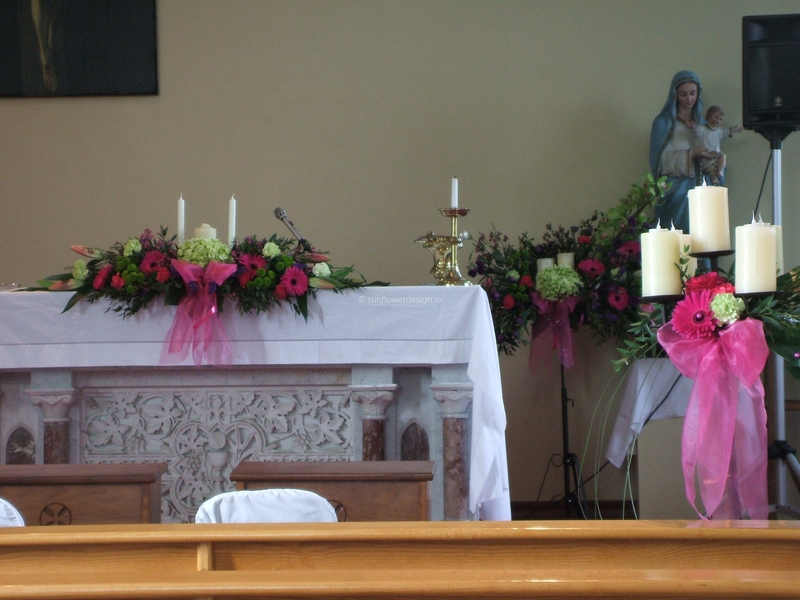 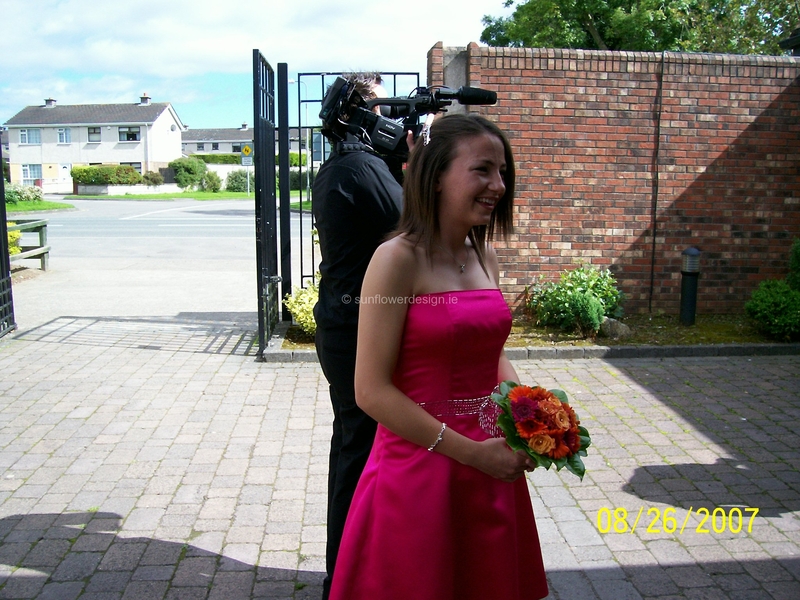 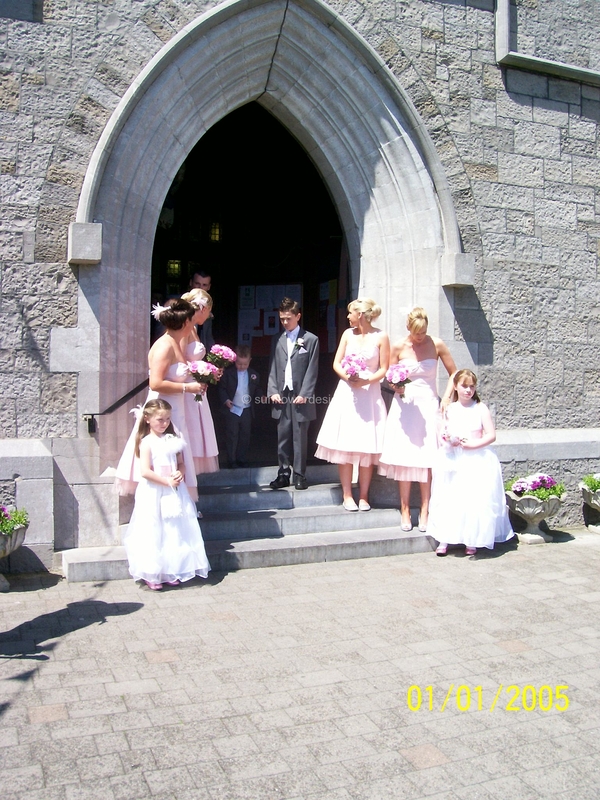 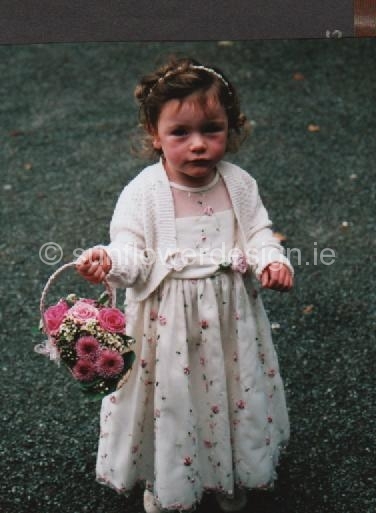 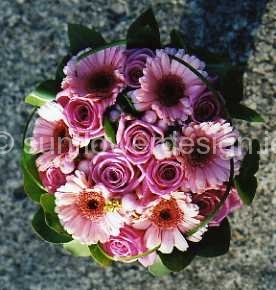 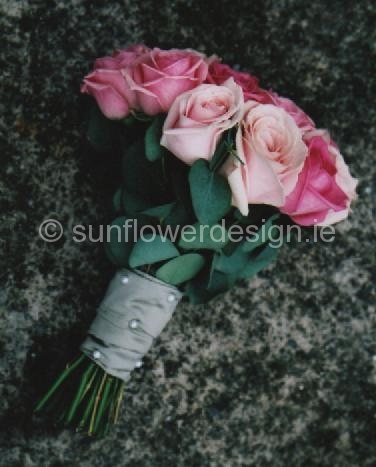 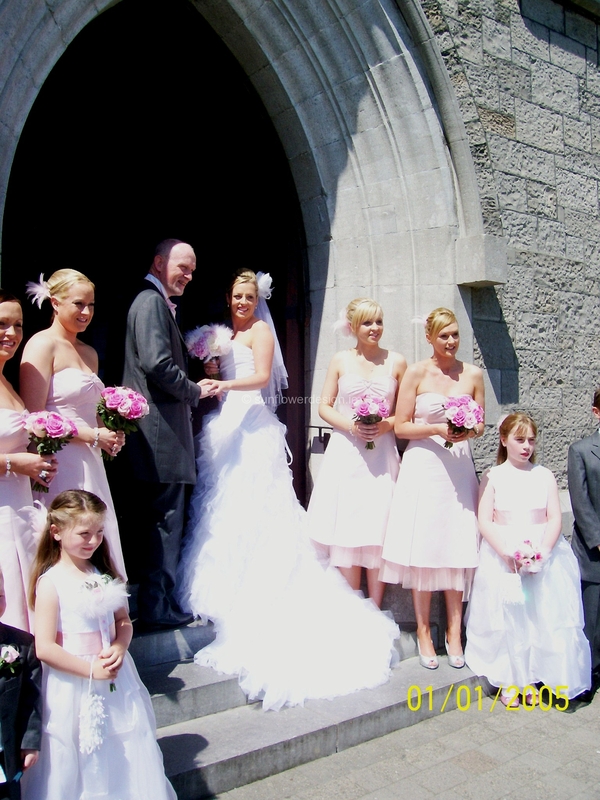 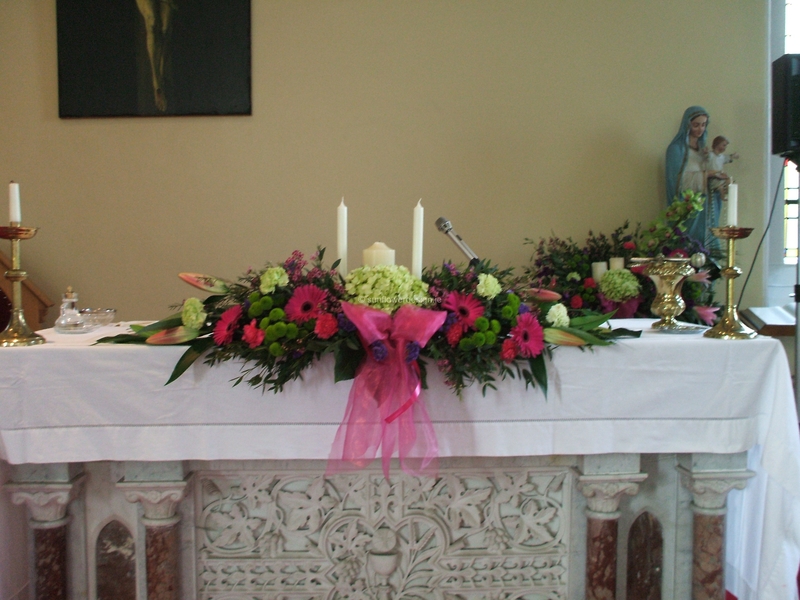 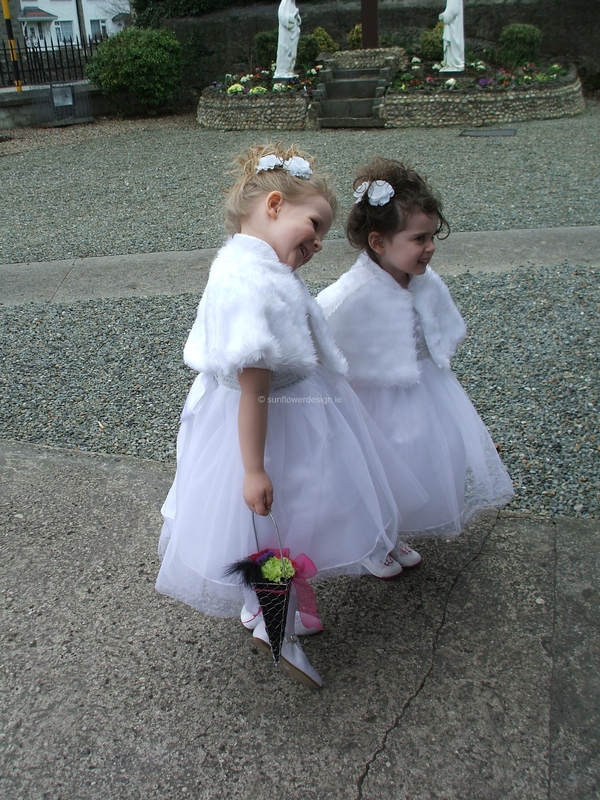 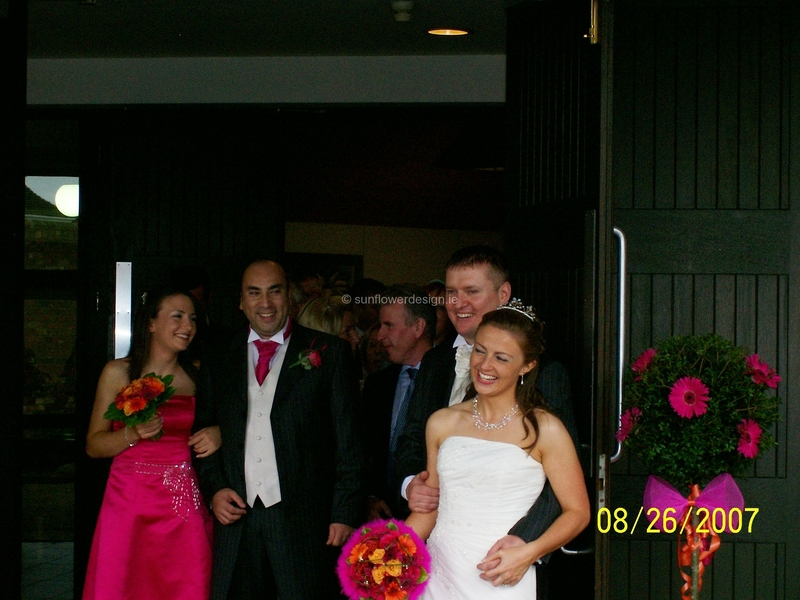 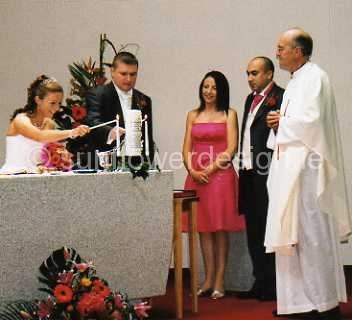 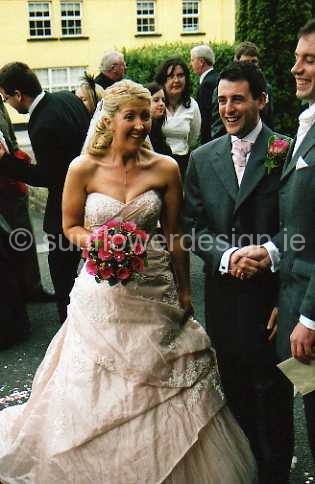 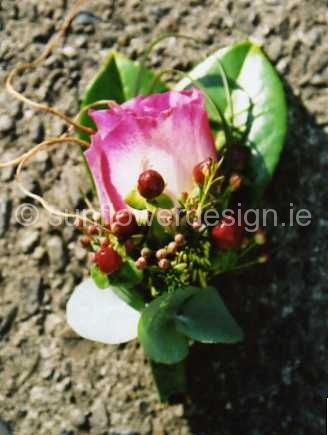 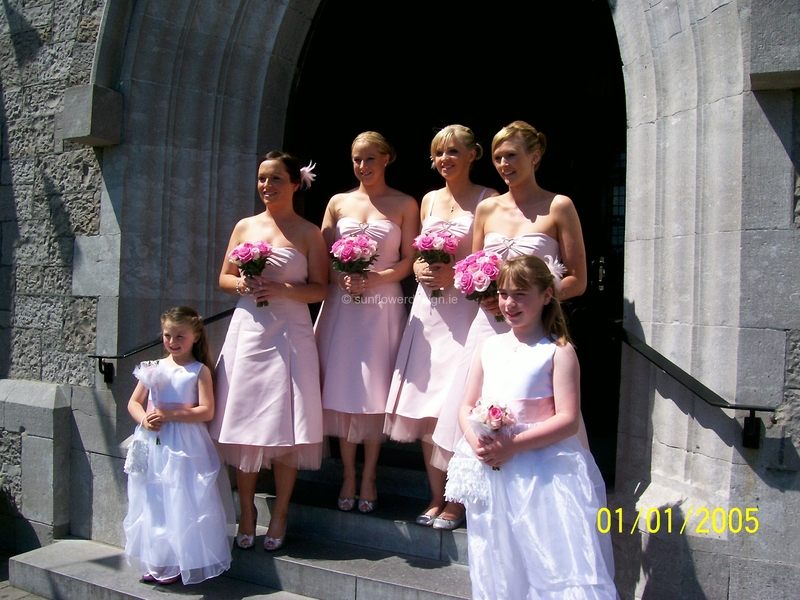 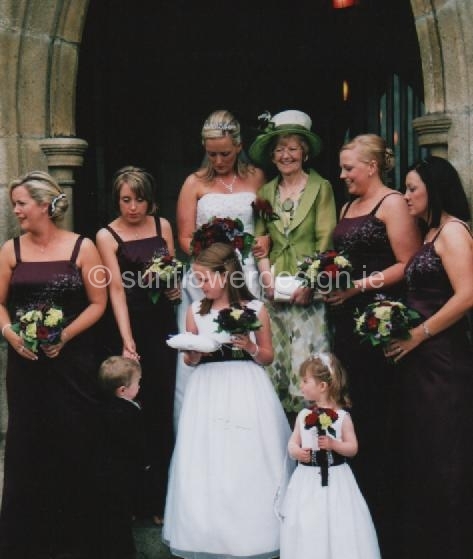 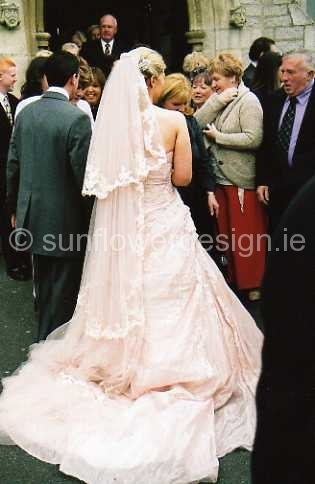 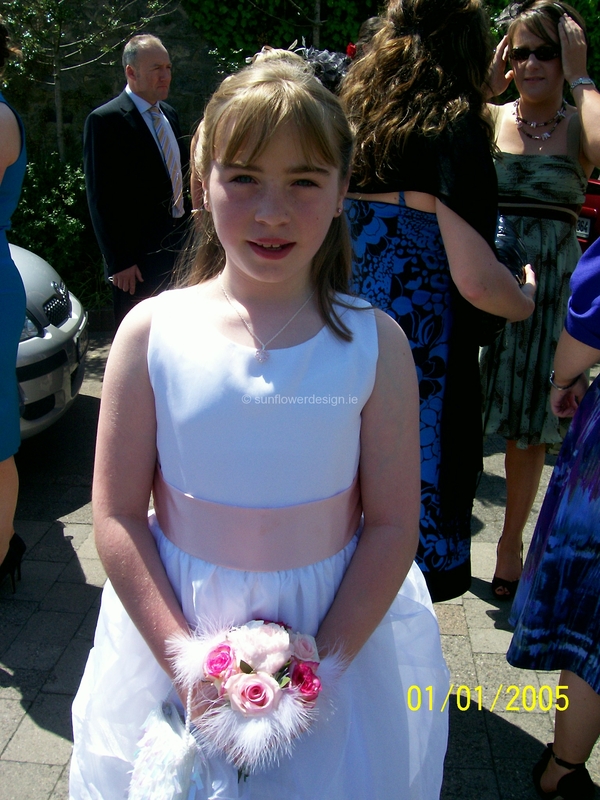 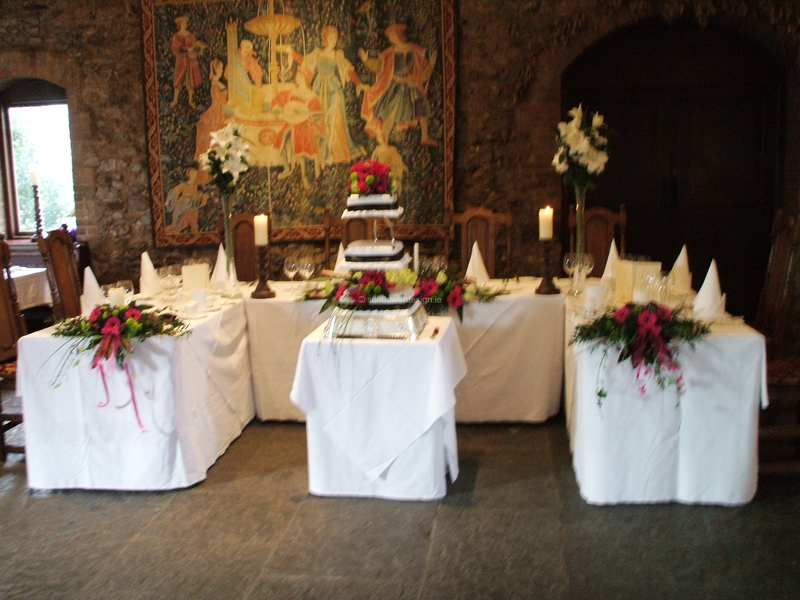 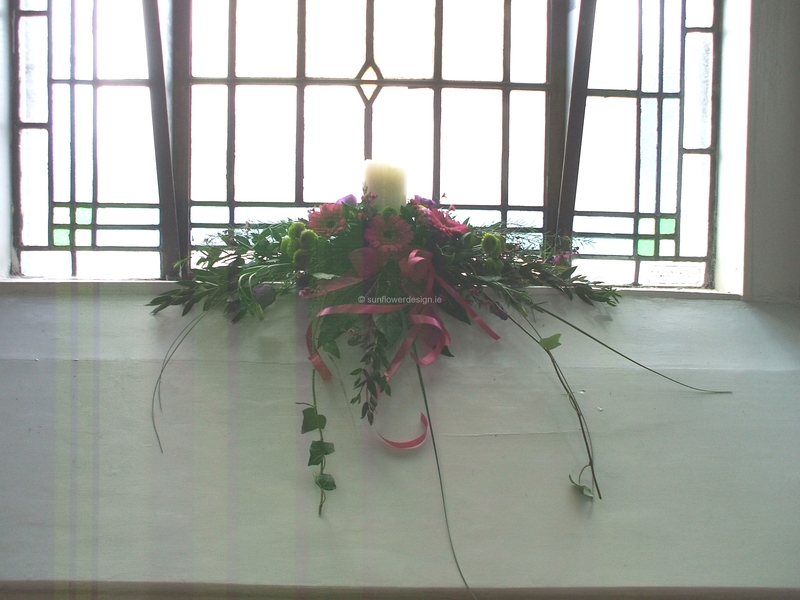 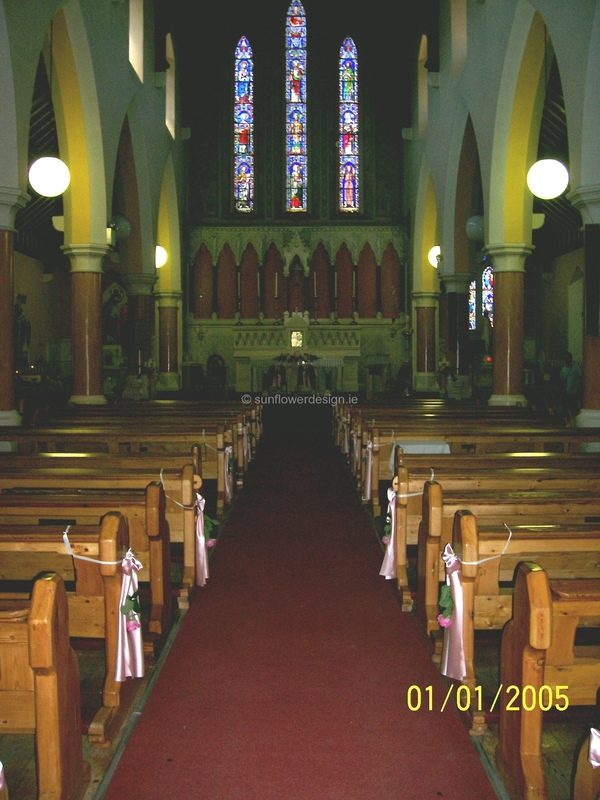 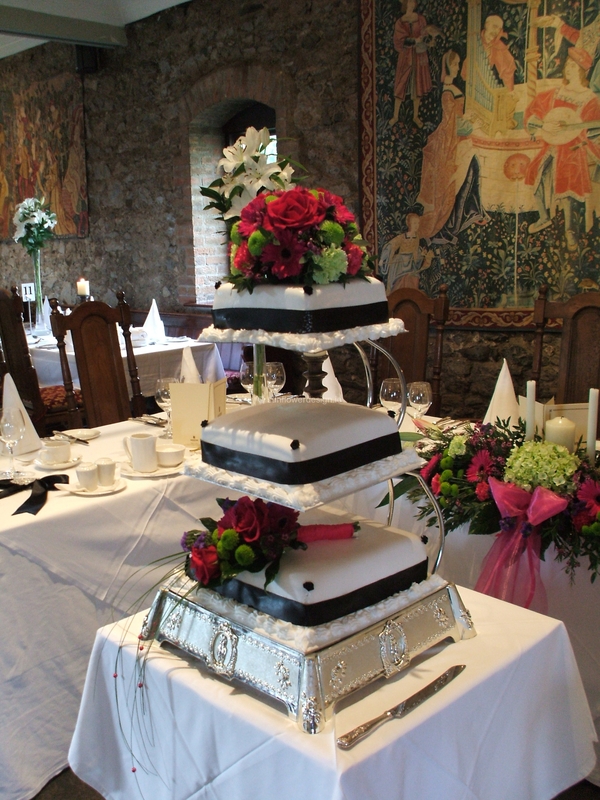 Orla carried the theme of strong pinks and lime green through to the Church and Reception.” – Eileen. 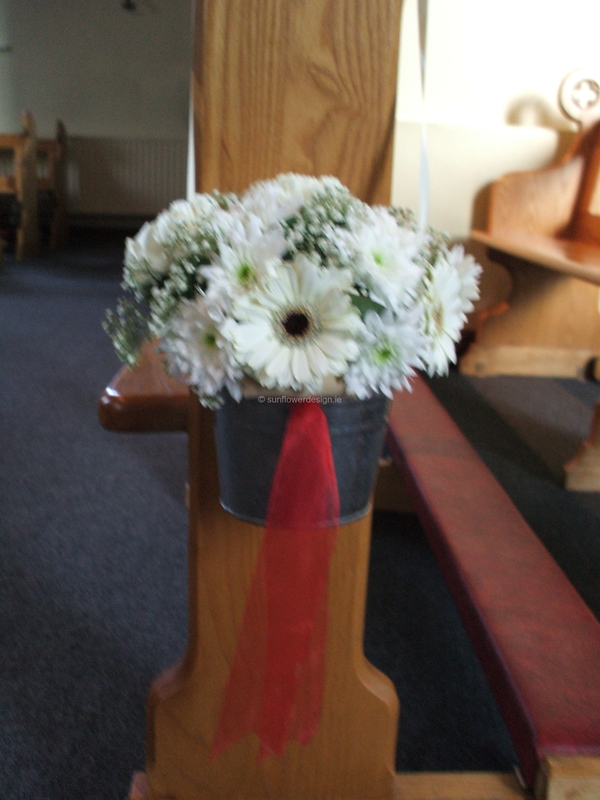 Just wanted to say a huge thank you for everything you did for us. 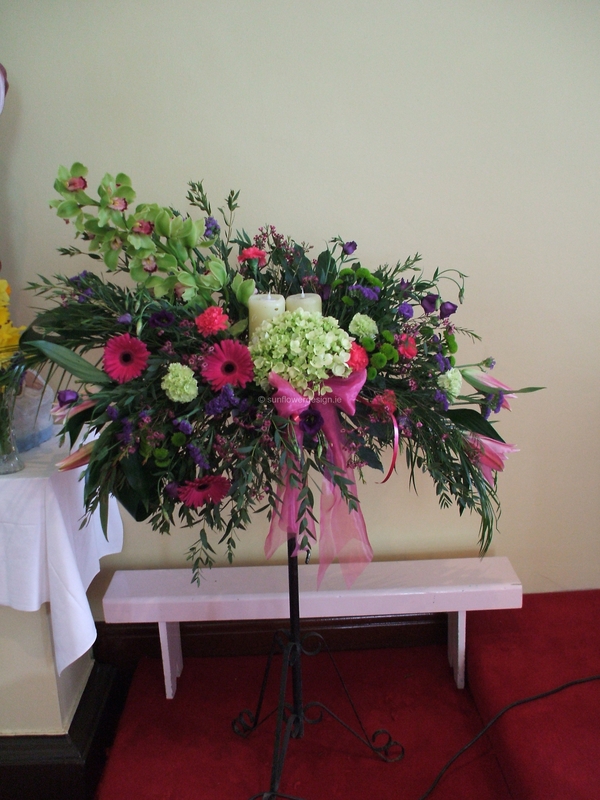 You went above and beyond and your attention to detail was fantastic. 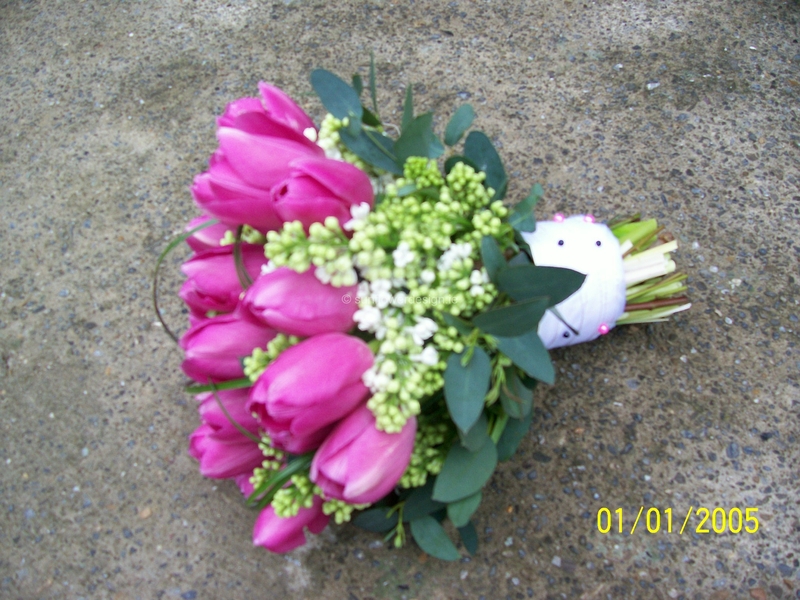 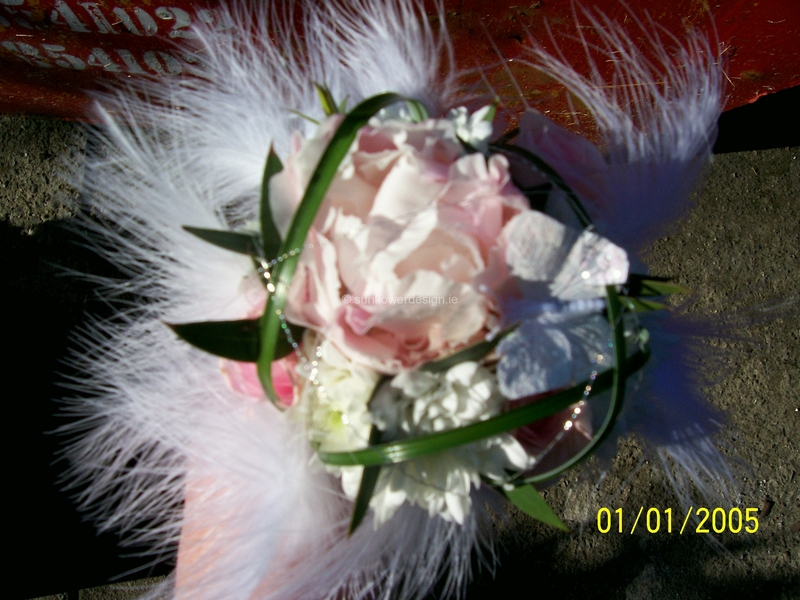 I was so pleased with my bouquet even though it was more of an engineering task! 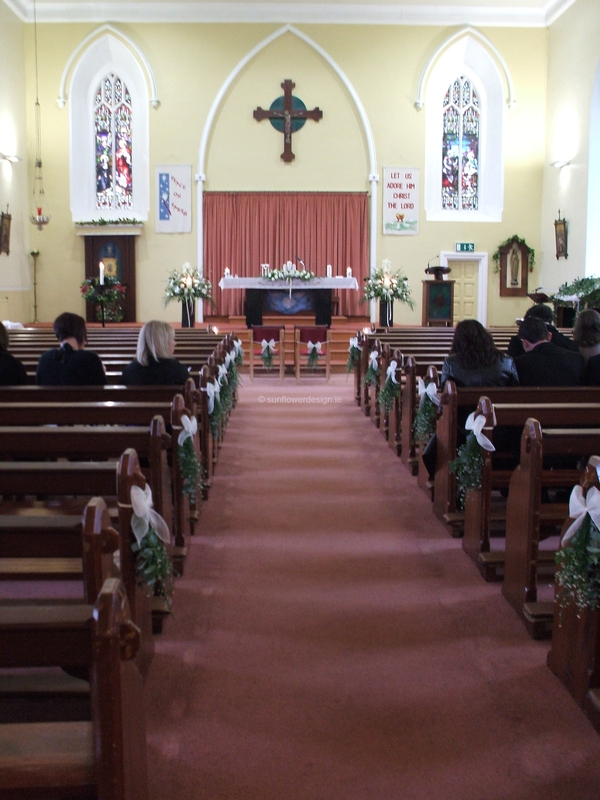 The Church was perfect as was the reception. 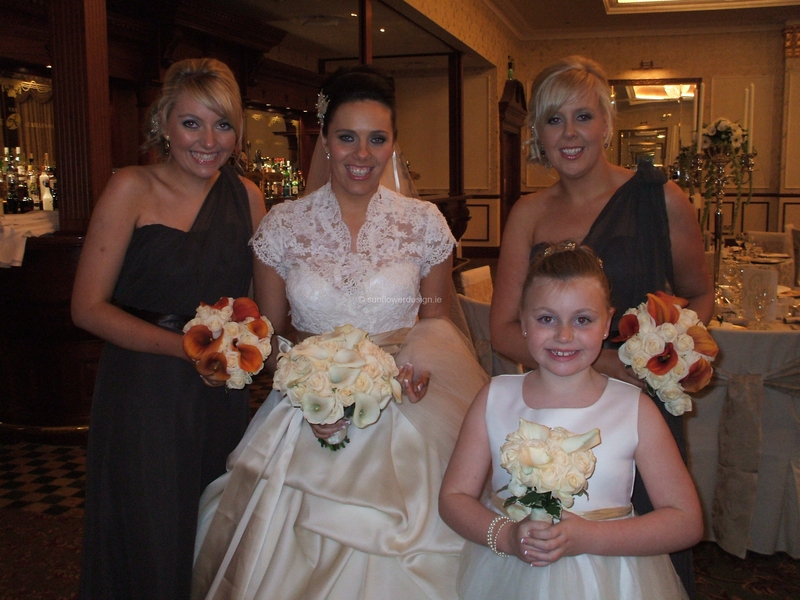 It was a pleasure to meet you and thank you for making our big day so perfect!